According to custom tuning and tailoring of any products crocodile. Male and female models of any products crocodile. Bags, briefcases, purses, diplomats, purses, wallets, purses, belts, cell phone cases, cases for tablets, spectacle cases, watchbands, business card, credit card, passport covers, covers for auto documents, bindings for books, boxes, phones, smartphones, tablets, laptops, flash drives, gadgets, trinkets, clothing, gloves, jackets, pants, shoes, caps, furniture, sofas, chairs, tables, pillows, railings, frames, moldings, carpets, furnishings, jewelry, decorations, rings, bracelets, pendants, cufflinks, tie clips, pens, luxury kits, key chains, key rings, sport accessories, sticks, whips, gifts, prizes, awards, souvenirs and accessories made of genuine crocodile, alligator, caiman, gavial skins. Any product can be combined with gold, sterling silver, wood, diamonds and other types of crocodile, alligator, caiman, ostrich, python, viper, iguanas, monitor lizard, cobra, anacondas, stingray, calf, bison, buffalo, deer, hippo, elephant, rhino, sea eel, sea snakes, karung, frog, toad, fish, and others. Unique VIP handmade accessories of all shapes and sizes of the most exclusive, rare and expensive materials from MJ. 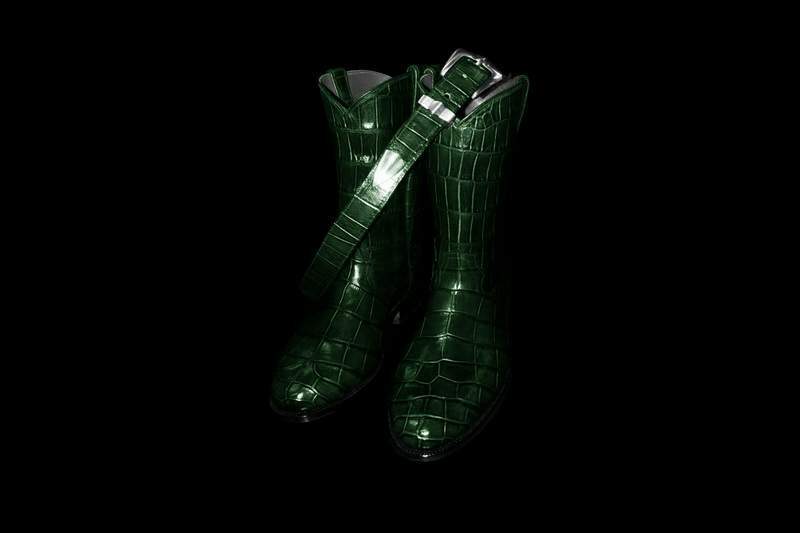 In the art studio MJ represented a huge range of different colors and subspecies crocodilians leather. 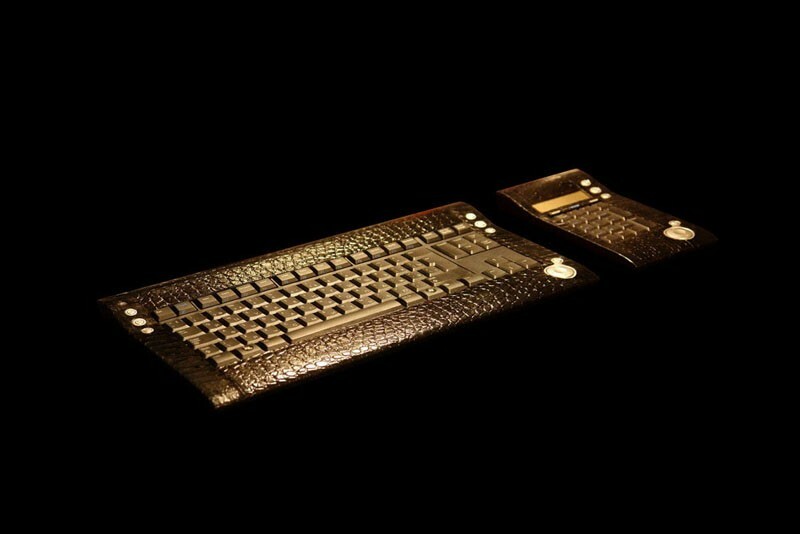 Exclusive laptop skin Colombian crocodile, Laptop, mouse and USB flash drive decorated with gold and diamonds. According to custom tuning laptops, mice, flash drives and other accessories crocodile leather any color. 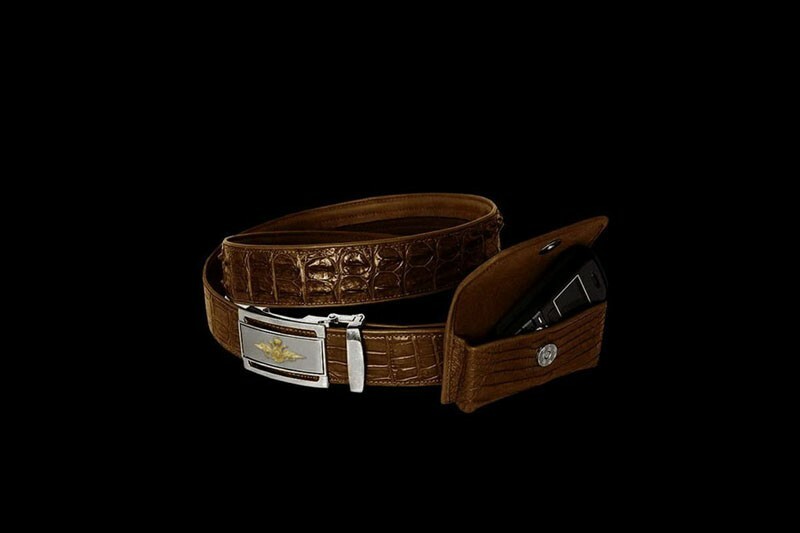 Luxury sets of belts and case for phone and accessories from crocodile skin. According to custom any color and type of leather with gold inlay. 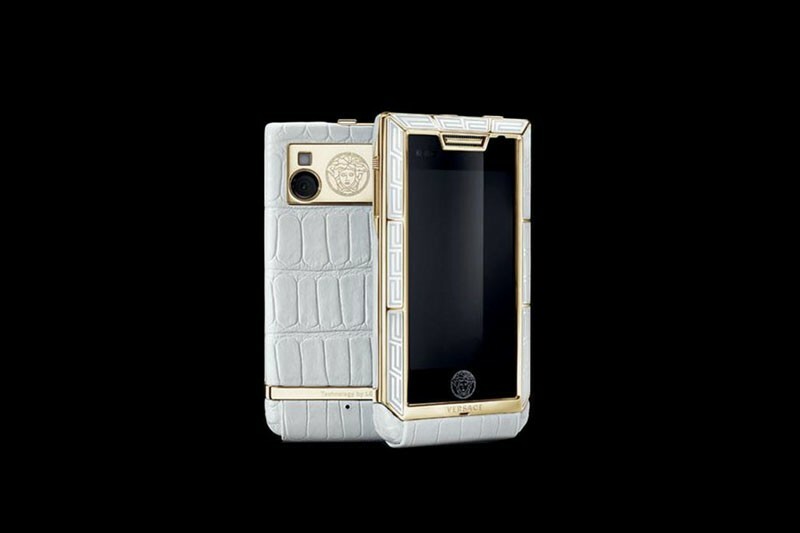 IPhone in a pink crocodile skin with the emblem of the platinum gold and diamonds. 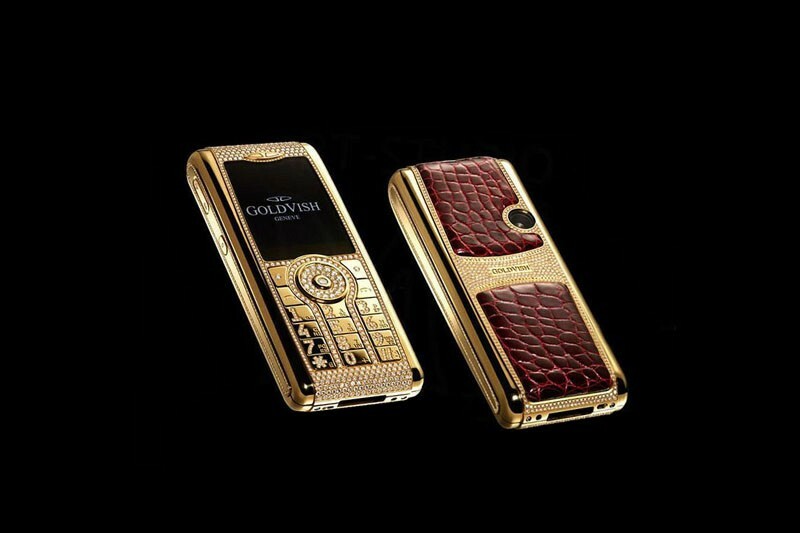 Individual customization of phones in crocodile skin and other exotic of all colors. Can any emblem inlaid with sapphires, rubies, emeralds, diamonds and other precious stones. 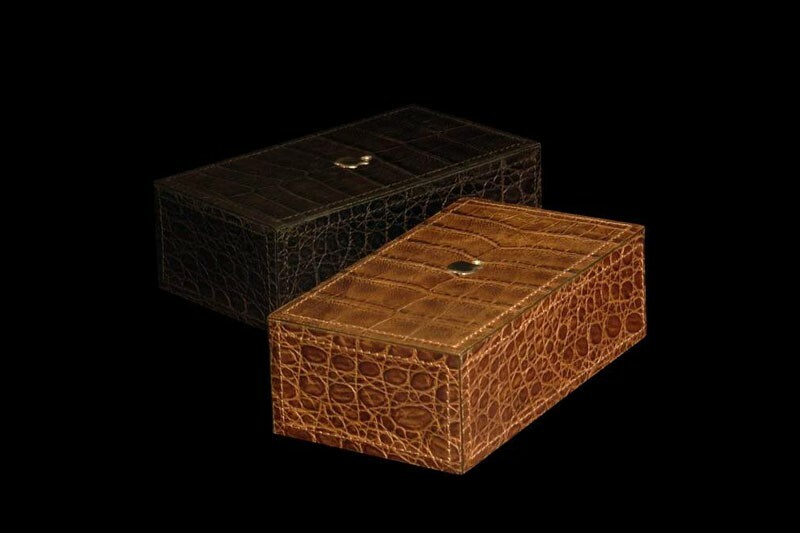 Individual orders exclusive boxes and boxes of all sizes from crocodile skin of any color. Also at the box inlaid with gold or silver any emblem, initials, emblems, signs of the zodiac and other symbols. Unique bags unique crocodile. 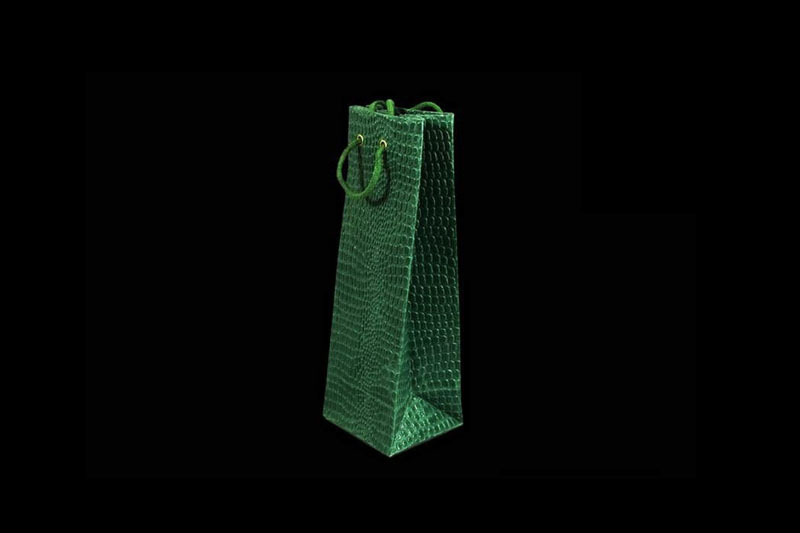 Bags of royal crocodile. Crocodile leather royal elite class Oris - a specially selected top-grade skin without a single defect. 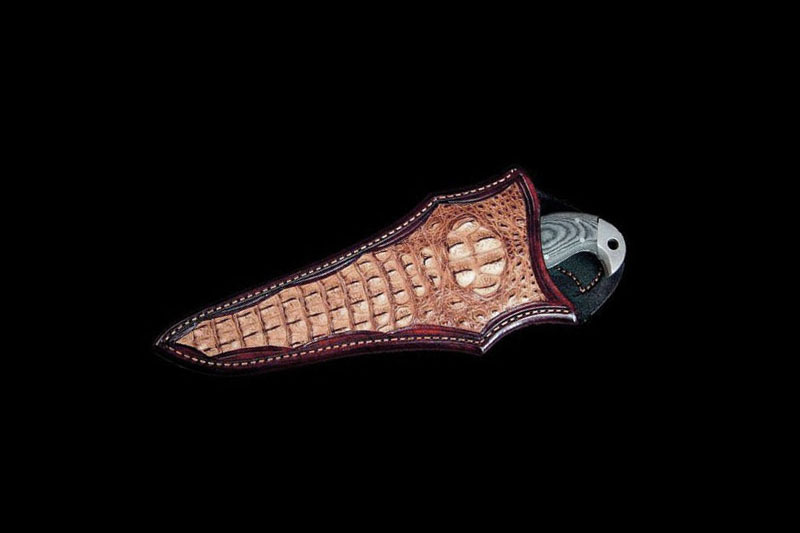 Exclusive covers points of genuine leather crocodile, alligator, caiman and other exotics. Individual orders spectacle cases of crocodile skin of all colors, shapes and designs. 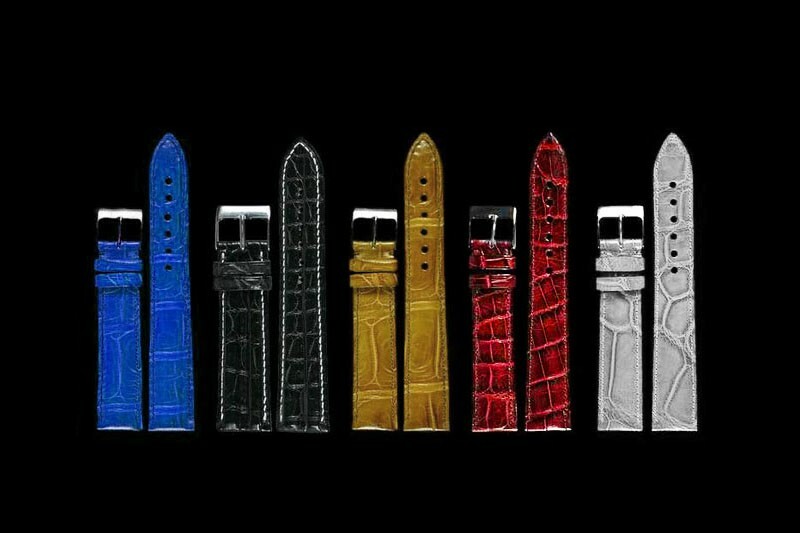 Exclusive handmade straps made of exotic crocodile skin. For any custom shapes and sizes watch straps with fittings made of precious metals. 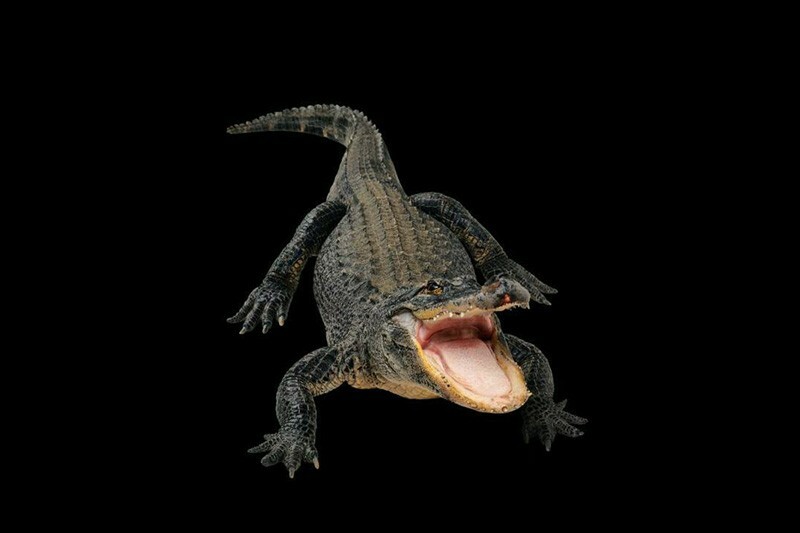 Real leather and stuffed crocodile, alligator, caiman, gharial and other reptiles. 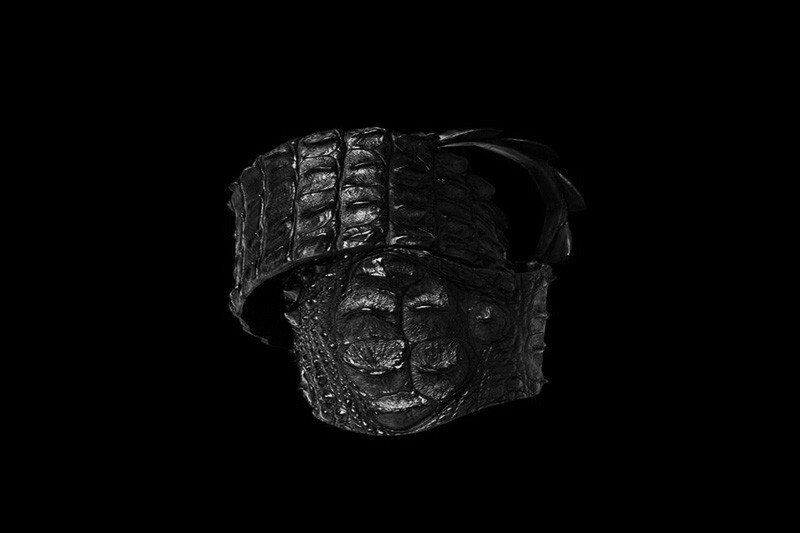 Exclusive bracelets leather crocodile, alligator, caiman and other reptiles. 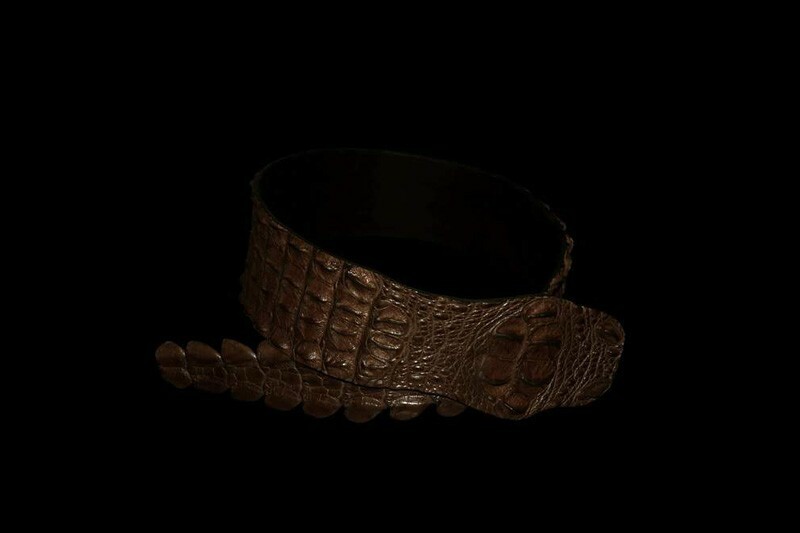 The button is made of precious metals - silver, gold or platinum with diamonds possible decor ..
VIP Genuine Leather Bracelet Exotic Reptile Edition - Crocodile, Alligator, Caiman etc. 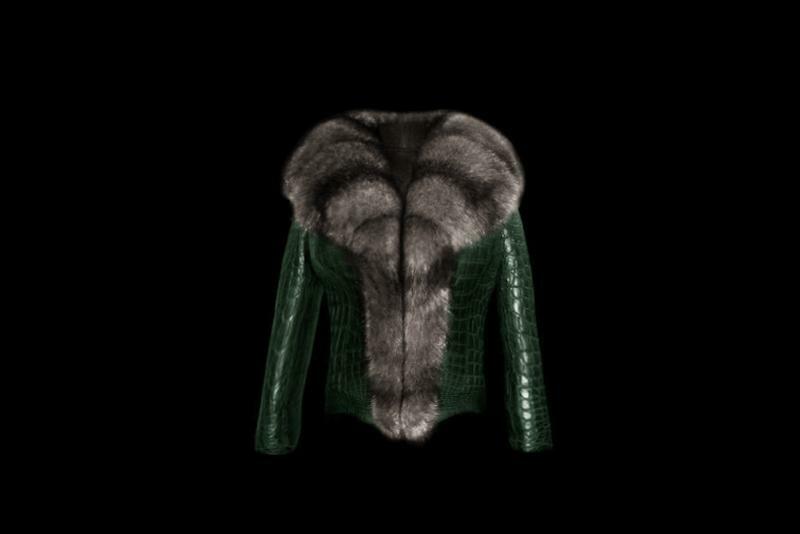 Exclusive Crocodile leather jacket with sable, mink, silver fox and other furs. shirts, pants, skirts, dresses, suits, and any other types of clothing and accessories made from crocodile skin. See also catalog of exclusive handmade clothes - www.clothes.mj777.com. 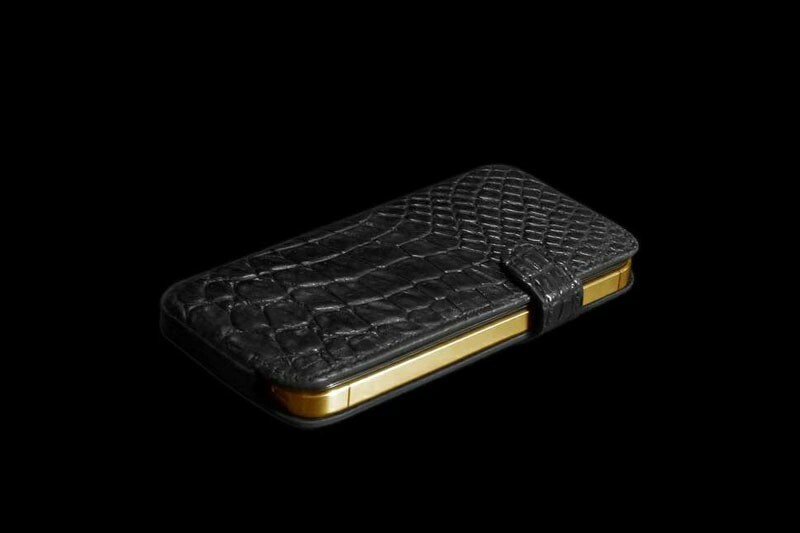 Fashionable Case for Phone Vertu Signature S Design from crocodile skin. Fittings made of cast white gold and diamonds. 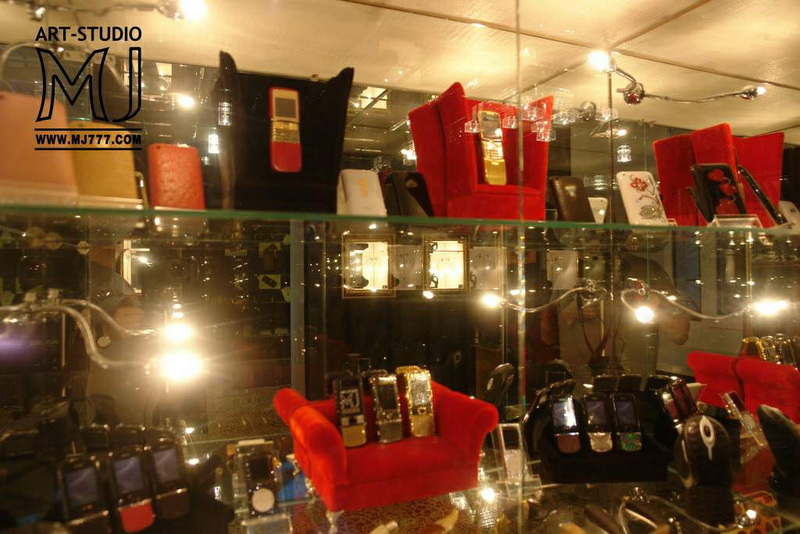 Exclusive tuning and customization of covers and accessories Vertu. Only handmade. Only precious materials. 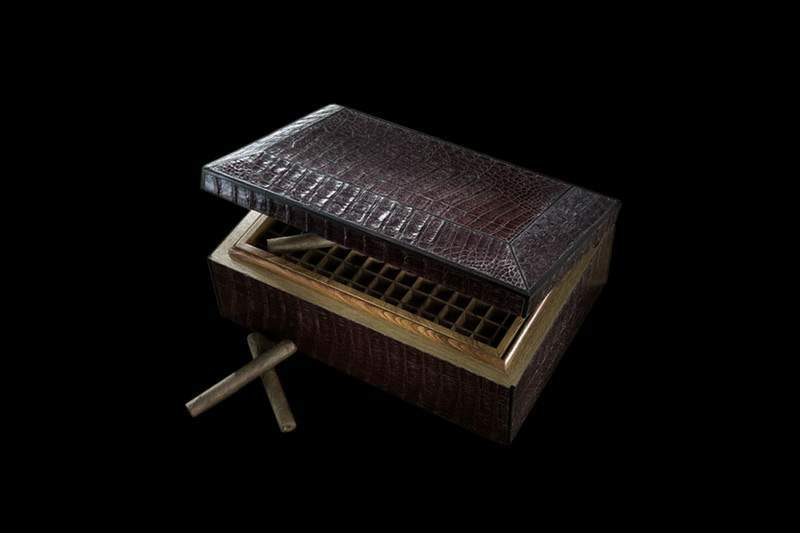 Exclusive wooden box in crocodile leather trim. VIP box, cigar box. For any custom leather box for any items of all shapes and sizes. 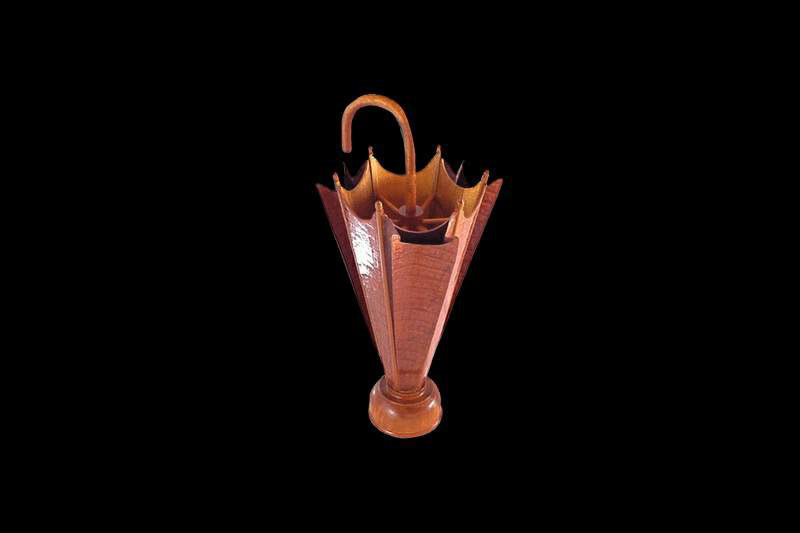 Luxurious umbrella holder in the decoration of genuine crocodile leather. Individual orders exclusive VIP umbrellas and parasols crocodile leather any color. 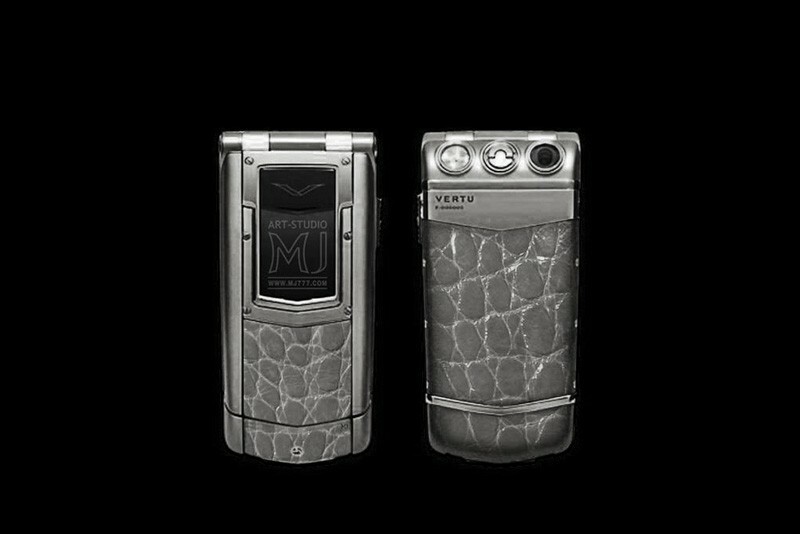 Tuning any models Vertu precious metals and exotic crocodile skin and any other exotics. 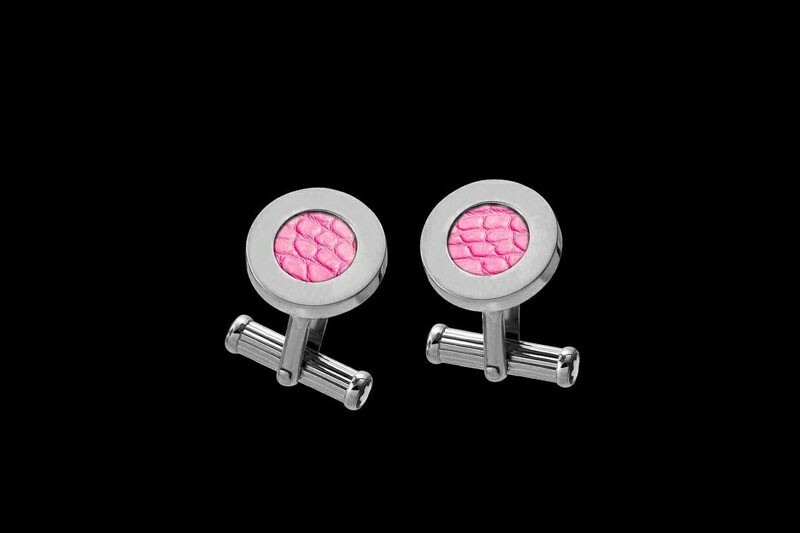 Cufflinks silver, white gold or platinum with accents of pink crocodile leather hand-made by MJ. 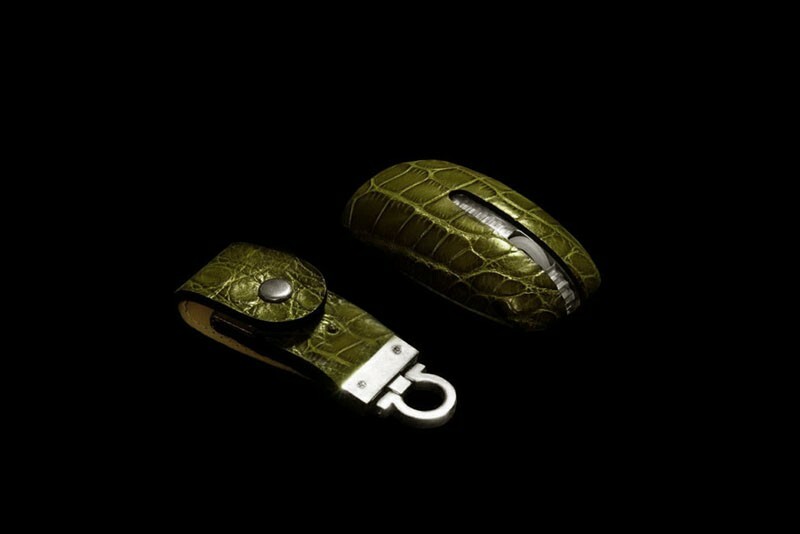 Computer flash drive and mouse genuine crocodile leather with fittings from precious metals. 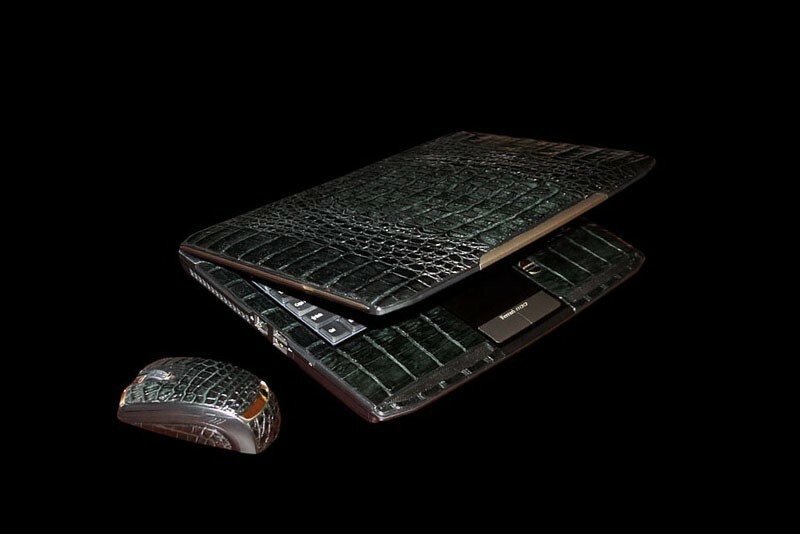 Laptop, phone, mouse, flash drive and briefcase for laptop and accessories made of genuine crocodile leather and gold. 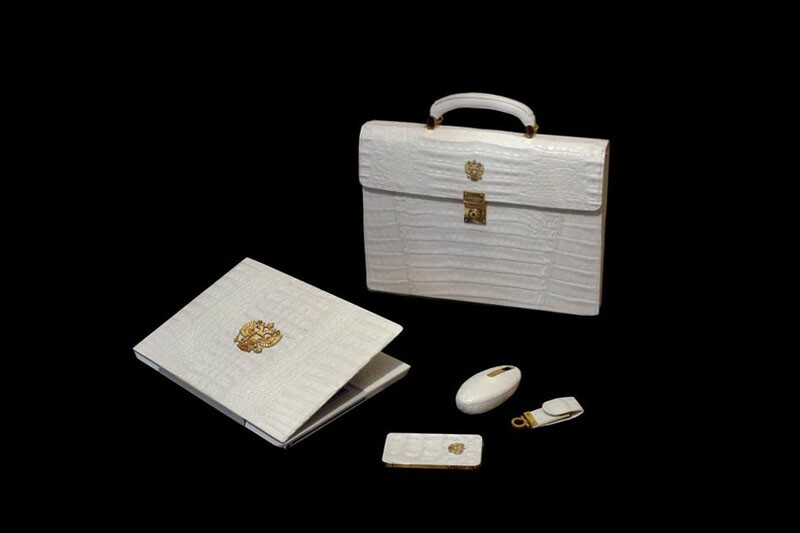 Presidential suite handmade white leather crocodile with the state symbols of cast gold 777k. For individual orders, any coloring of the skin. Accessories and decorative items made of silver, platinum or gold. According to custom notebooks in the skin of crocodile and other exotic of all colors. 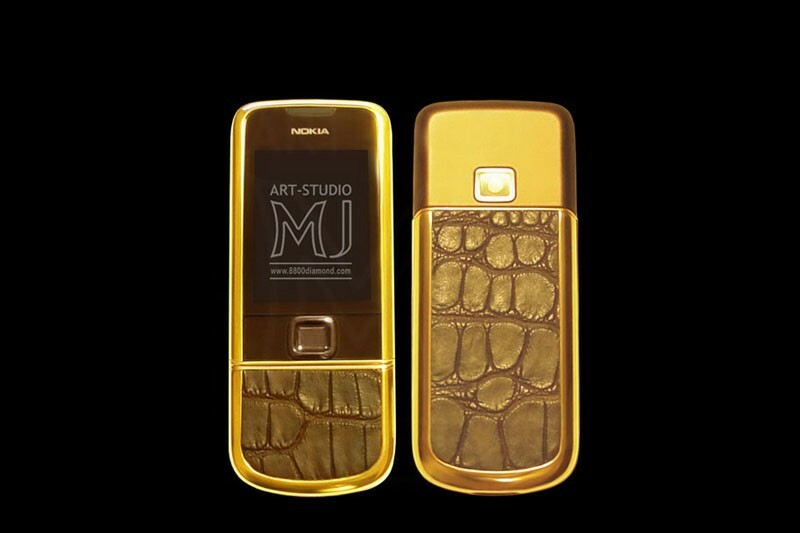 Gold phone decoration from genuine crocodile skin. 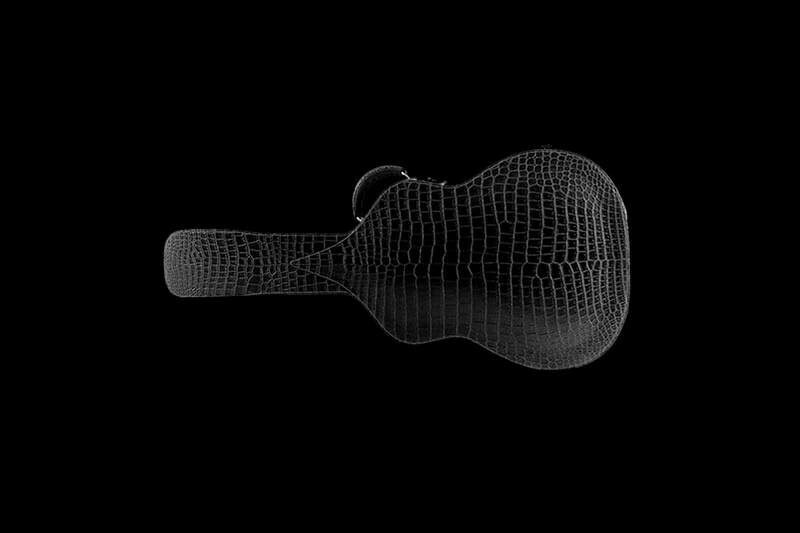 Cases and covers for weapons, sports equipment, musical instruments and other products. Genuine leather crocodile. 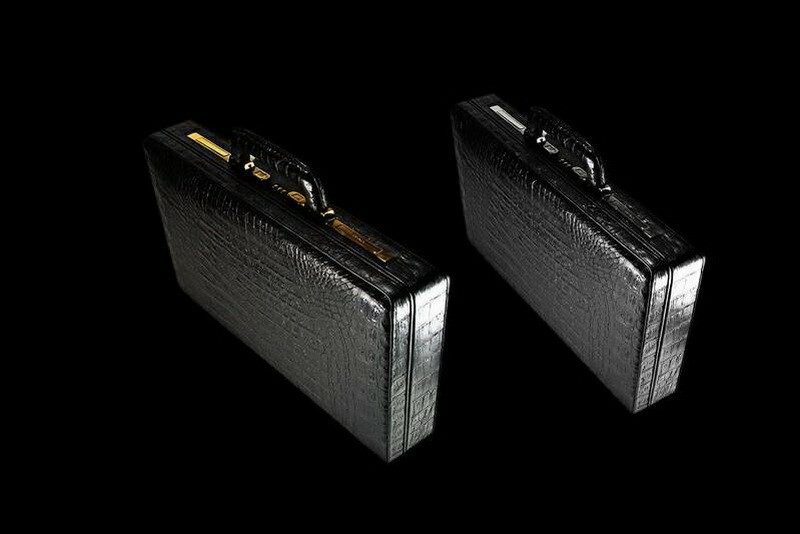 Case for shotgun and rifle from crocodile skin. 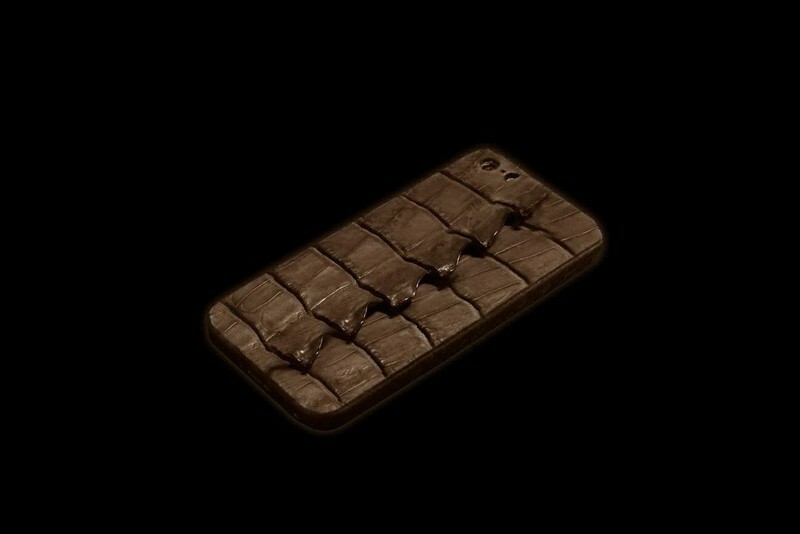 Case for billiard cue from crocodile skin. 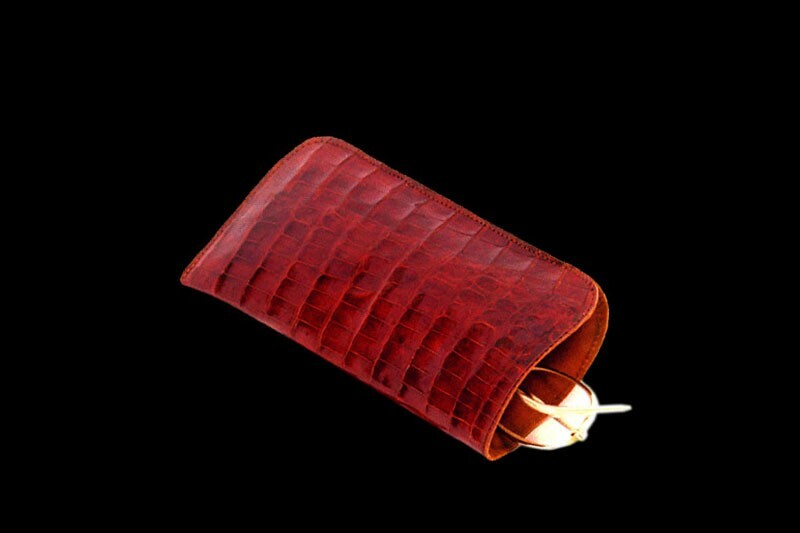 Case for club or tennis racquet from crocodile skin. 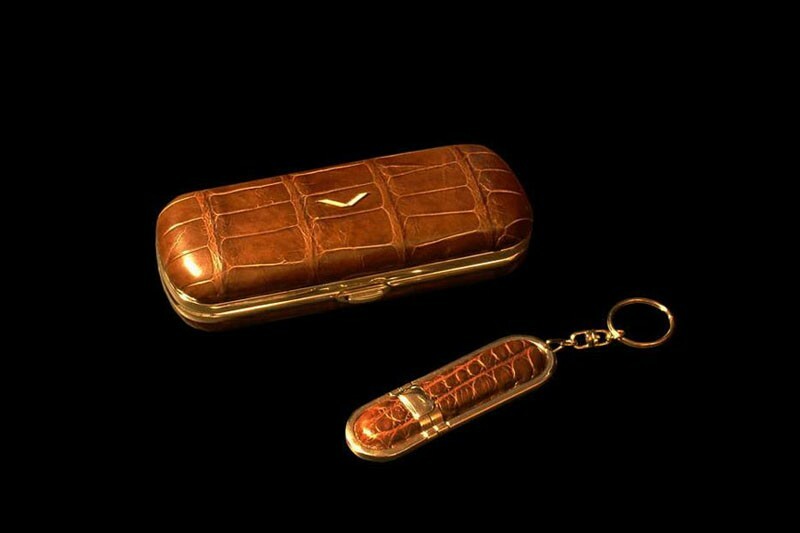 Case for Violin and pipes from crocodile skin. 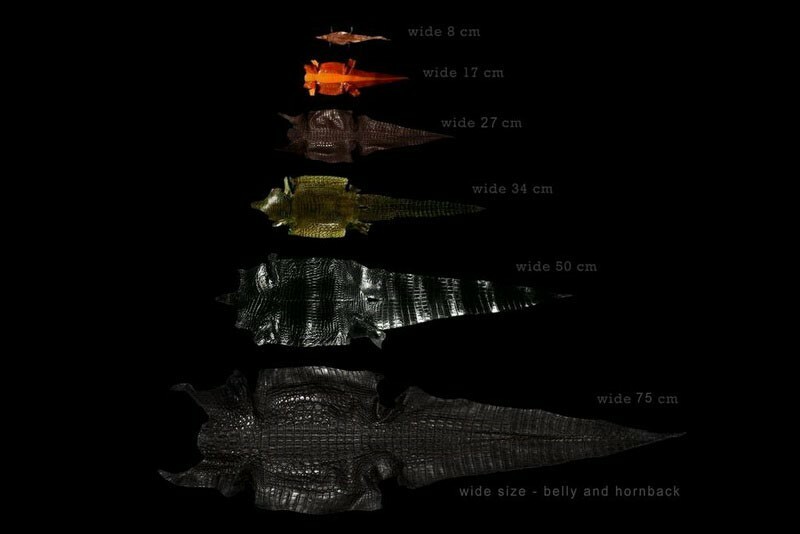 Crocodile skin in real size and proportions of 5 to 80 cm (from 2 to 32 inches) wide in the stomach. Exclusive skins with a head the size of a meter in the stomach, and more than 3 meters in length (120 inches). 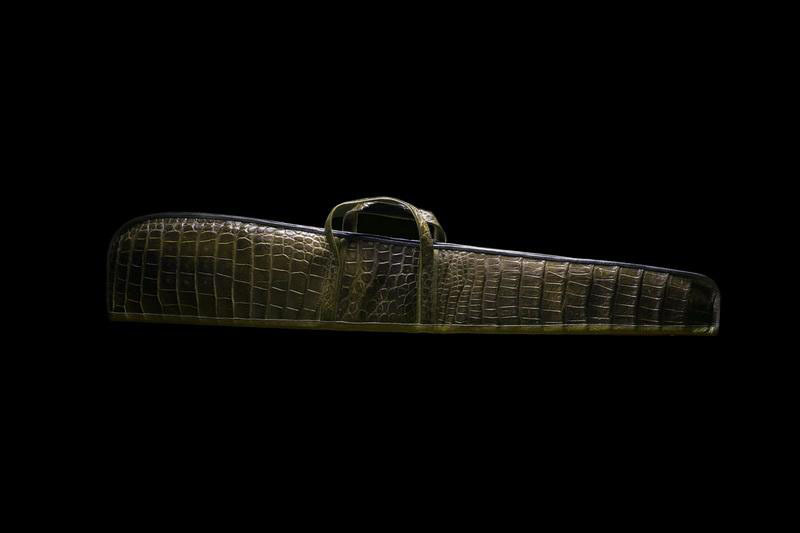 Unique interior crocodile skins. All kinds of manufacture, semi, lacquer, glossy and others. 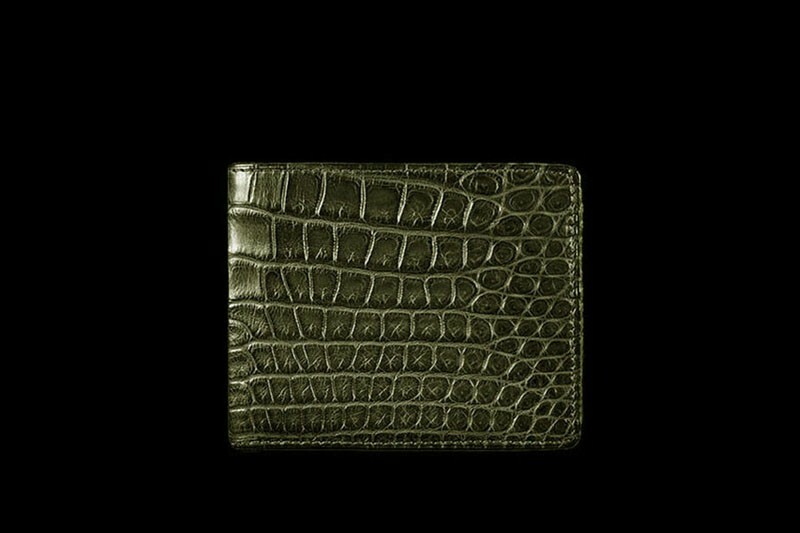 As well as all kinds of crocodile skin for exclusive tuning and tailoring of any products. Exclusive desks and tables in the finishing of crocodile leather. 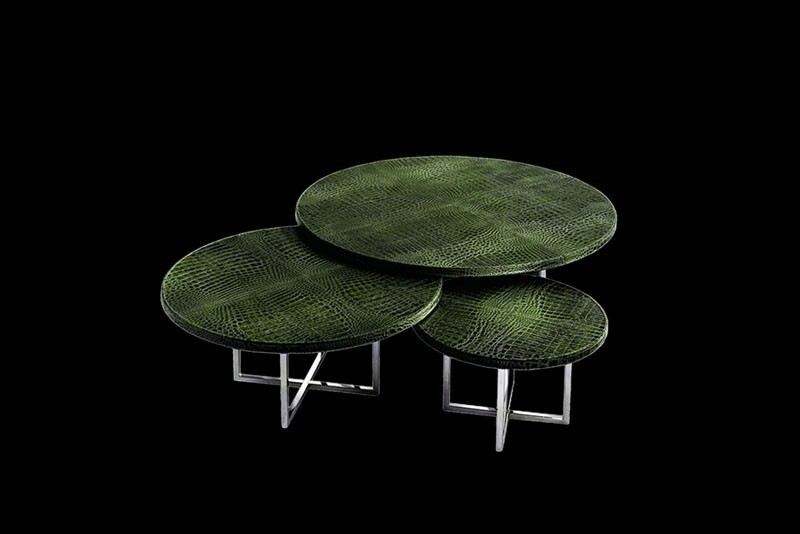 According to custom countertops, chairs, sofas and other furniture upholstered in crocodile leather. 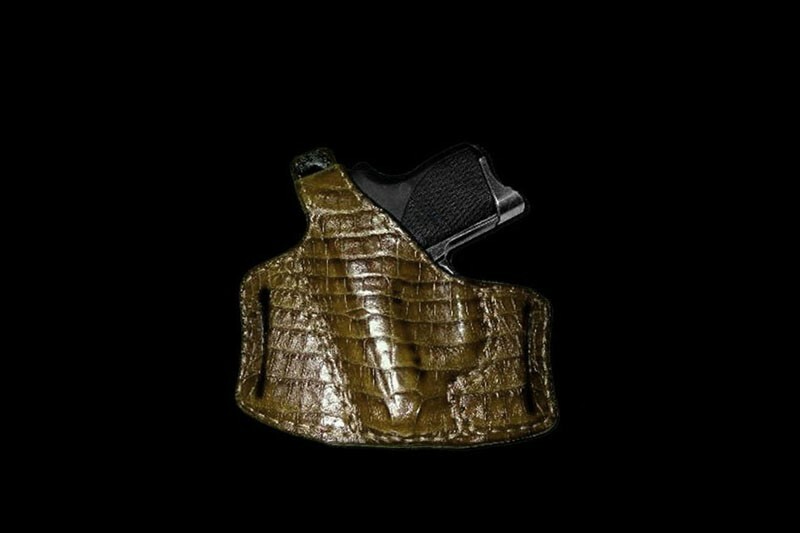 Luxury safe in leather crocodile, alligator, iguanas and other reptiles. On individual order safe all sizes with decorative natural leather of all colors. Album of crocodile skin, crocodile leather Business card, credit card from crocodile skin, frames made of crocodile skin. Appointment of crocodile skin. 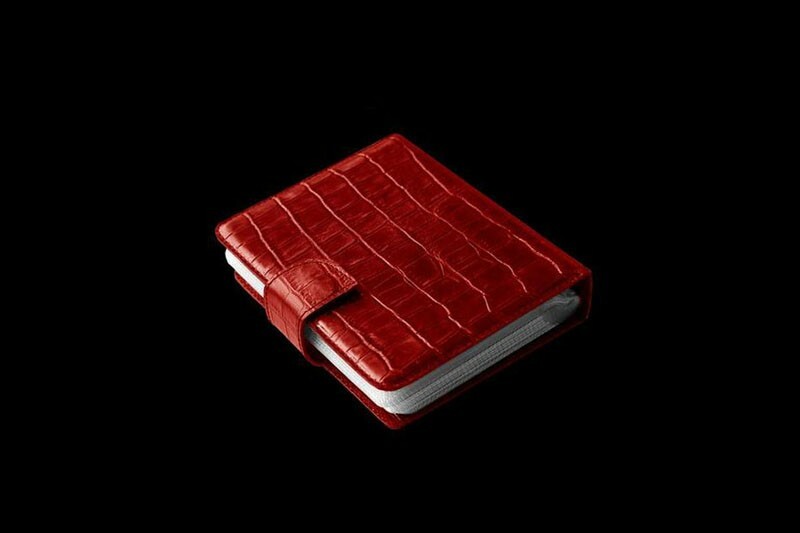 Crocodile leather notebook, Notebooks for a driver's license from the skin crocodile. Album for storing CD / DVD / Blue Ray discs from crocodile skin, books for discount cards from crocodile skin. 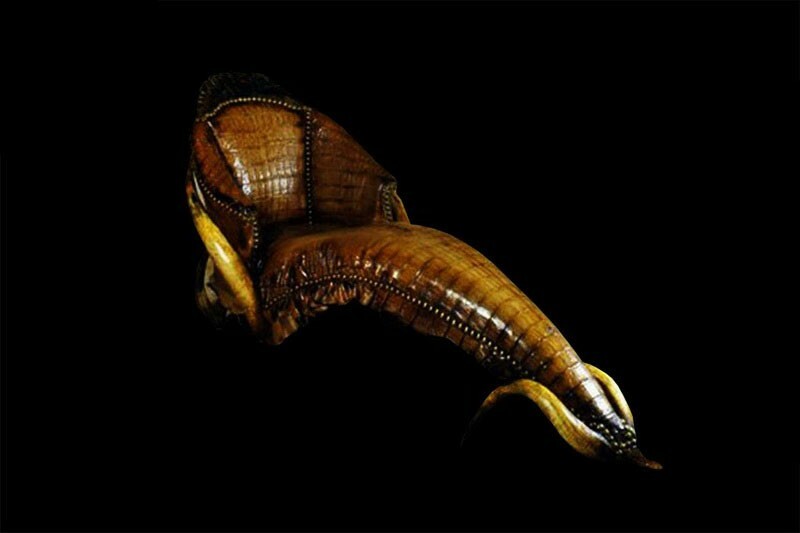 Chair sofa crocodile leather, silver, gold, horn, bone, valuable woods and other exotics. Unique furniture of unique materials for individual orders with individual inlays ..
Elite diplomats from crocodile skin with fittings of gold and platinum. Gold hardware - 585k, 750k, 777k, 888k, and 999k gold, Platinum supplies 950 or 999-carat. 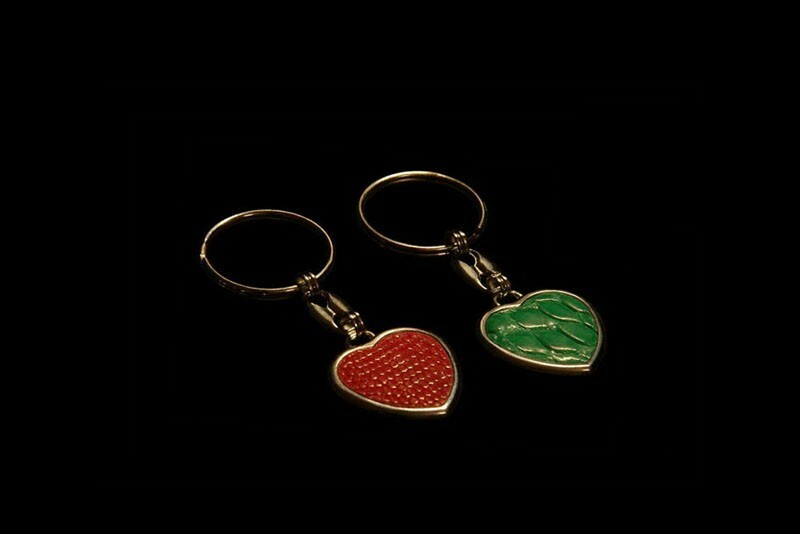 Also accessories can be personalized with a name engraved or embossed. Elite Case. Genuine leather crocodile. Gold 585-th sample. Only handmade. 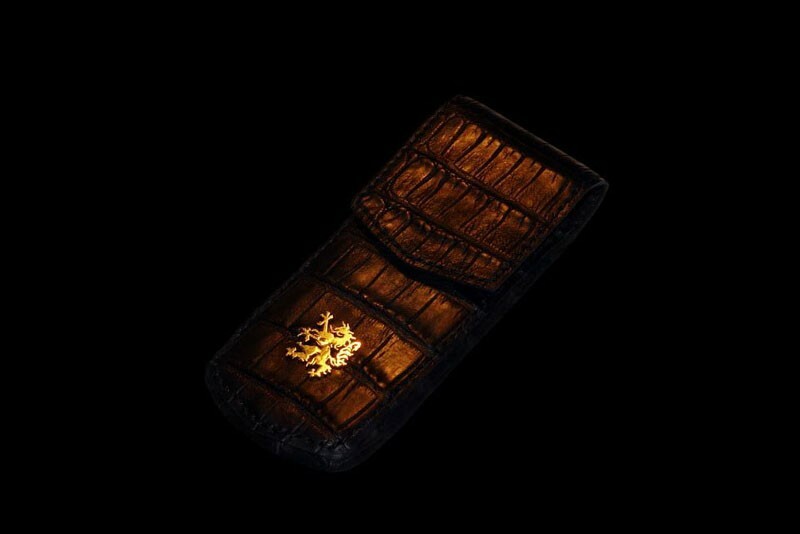 Leather Case for phone Mobiado Professional 105GMT Gold and any other models. According to custom covers from crocodile skin of all colors and sizes. 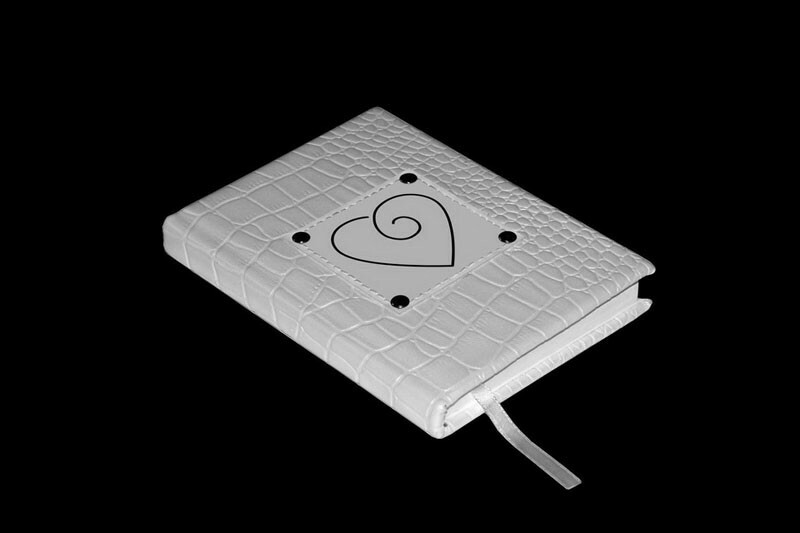 Personalized books from crocodile skin, diaries, folders, telephone directories and other small and large luxury books. Logos, initials, state emblems, family crests zodiac signs and any other symbols on the skin. Phone and cover in the same style. 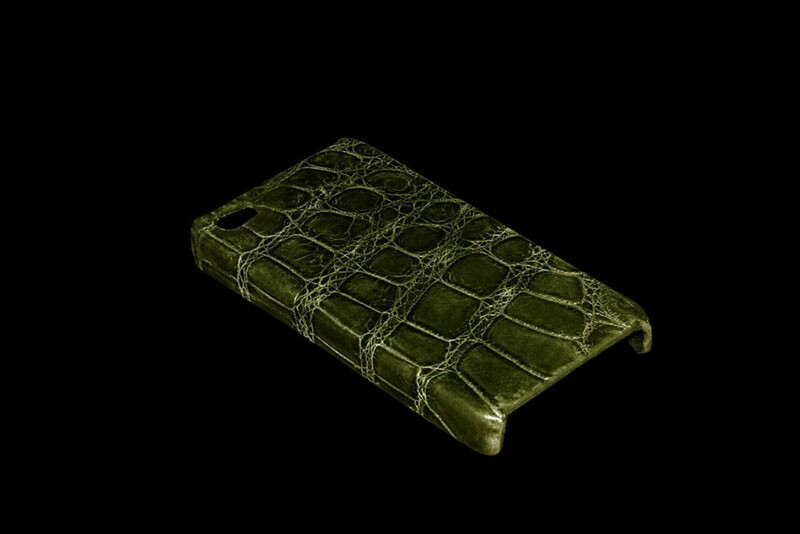 Insert your phone and cover are made of the same leather crocodile. Phones and Accessories Elite Class. According to custom any color skin of crocodile. 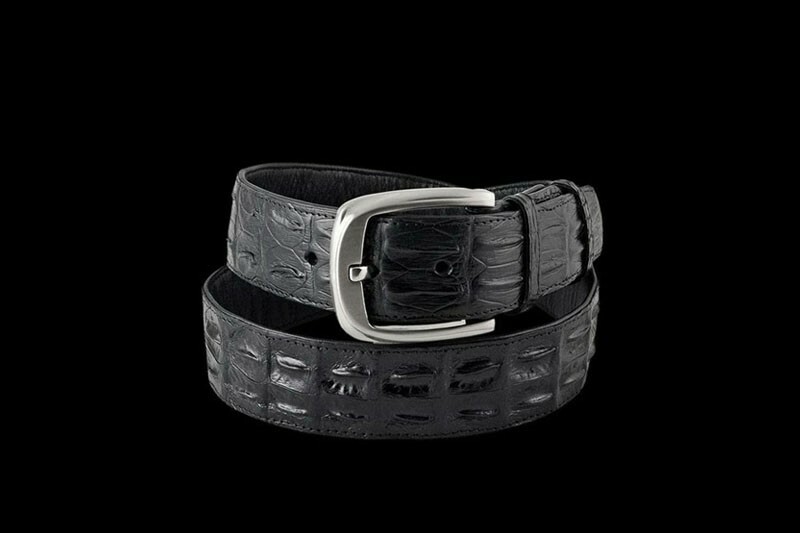 Individual orders for men and women belts and belts made of leather crocodile and other exotics. Any colors and sizes of leather belts with accessories made of silver, platinum or gold. 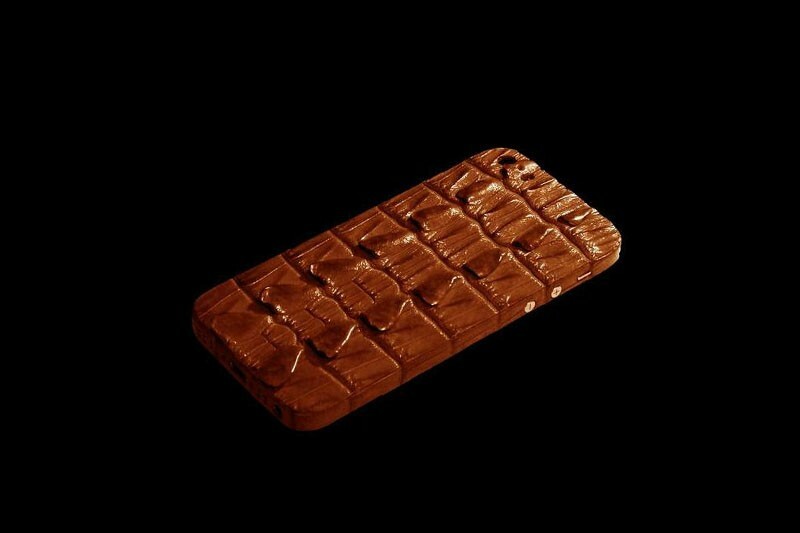 Exclusive case for smart phones from crocodile skin. Individual orders cases of crocodile skin all textures and colors. Exclusive keyboard in natural leather crocodile any color. 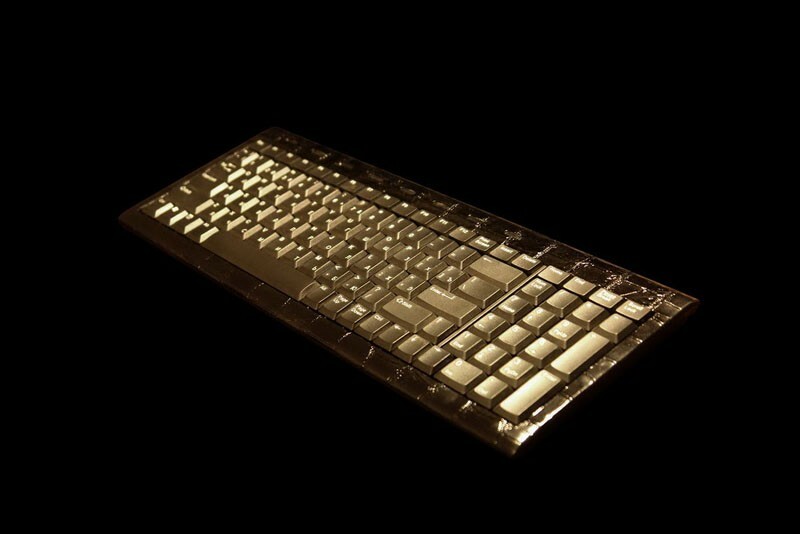 According to custom keyboards, mice, monitors, computers, joysticks, consoles in crocodile leather. Extreme luxury in the royal set of crocodile skin and gold. Case for phone memory stick thumb from MJ. 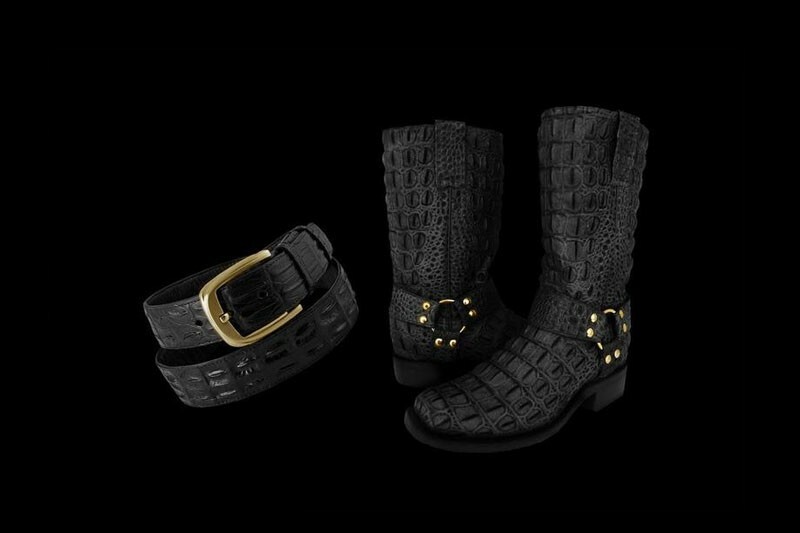 The entire set-cast made of 18-carat gold and genuine crocodile leather. 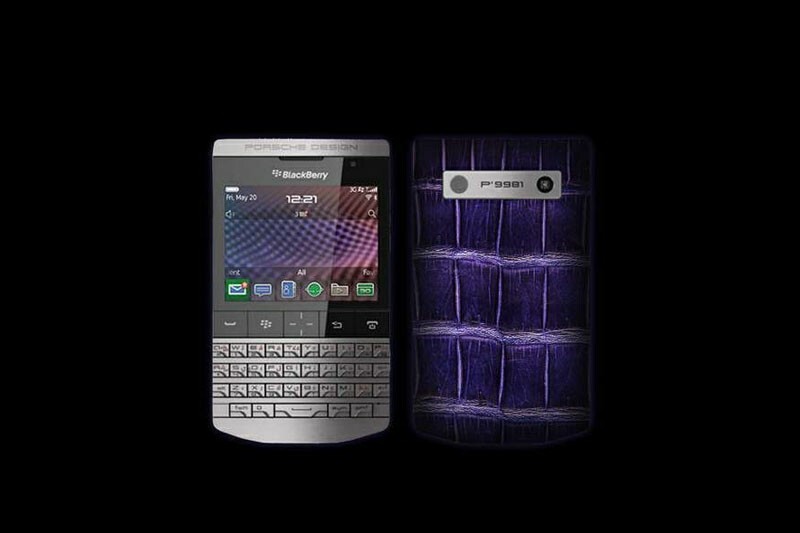 Luxury case based on the company's case Vertu Oyster Shell. Tuning of art-studio MJ. Exclusive ladies handbag leather crocodile tail. Production of unique products from central and tail of the crocodile. 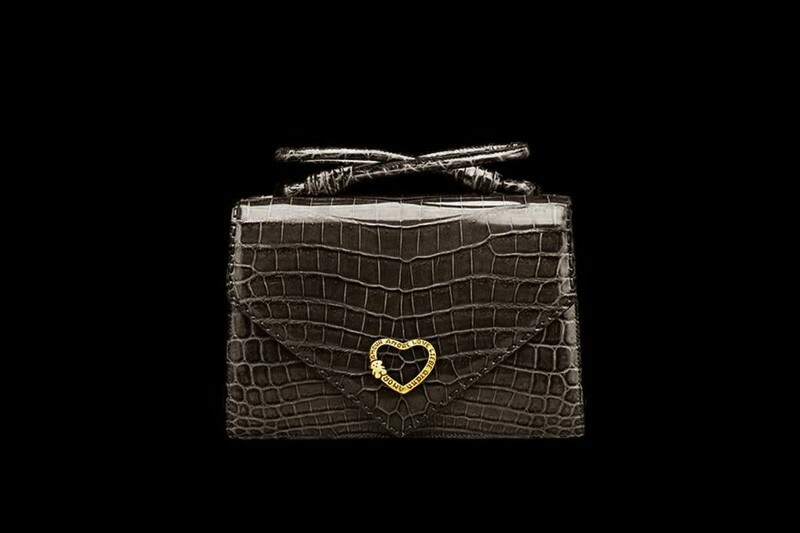 Exclusive bags, clutches, pouches of leather crocodile. blue, pink, red, tomato, raspberry, violet, milk, white, bleached and any other color of the skin. 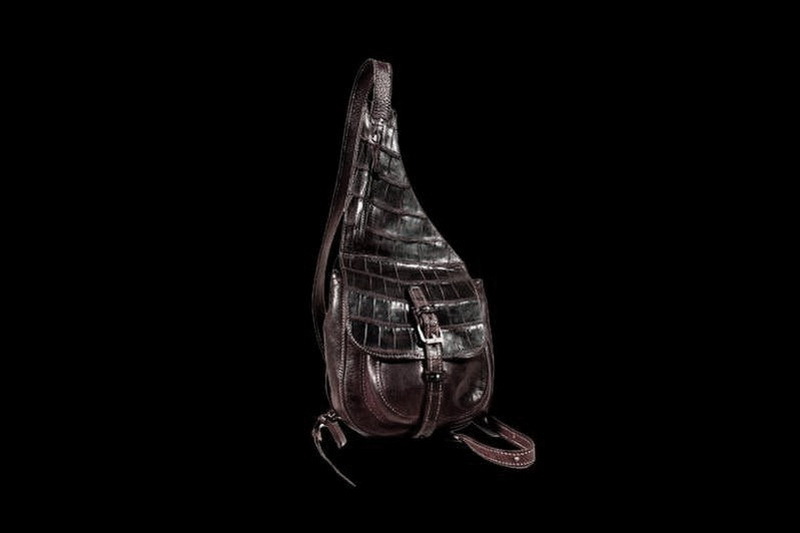 Shoulder bag from crocodile skin. 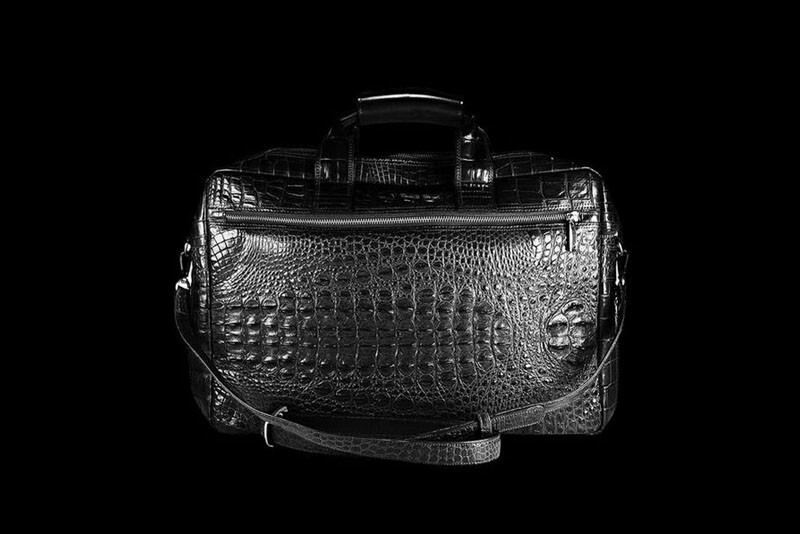 City business bag of crocodile skin. Bag for the driver of crocodile skin. 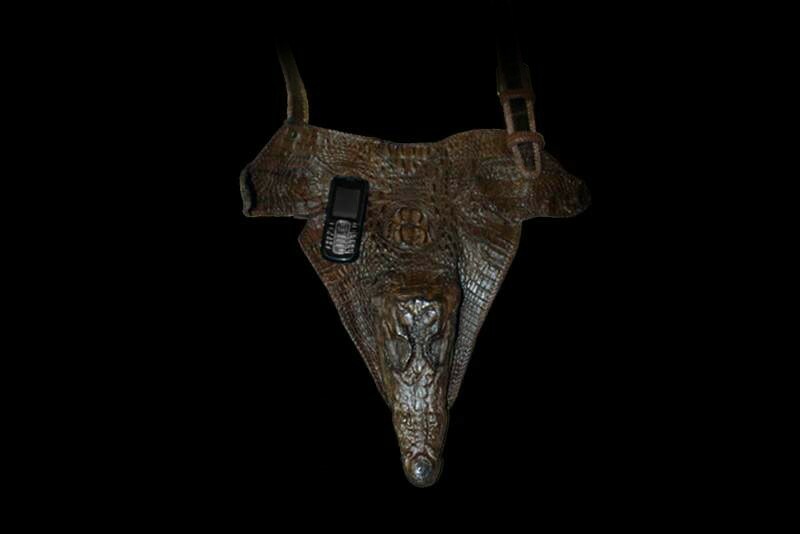 Unisex bag design Crocodile leather spiked head and neck reptile. Only exclusive handbags individual cut and hand-assembled. There may be any size and color. 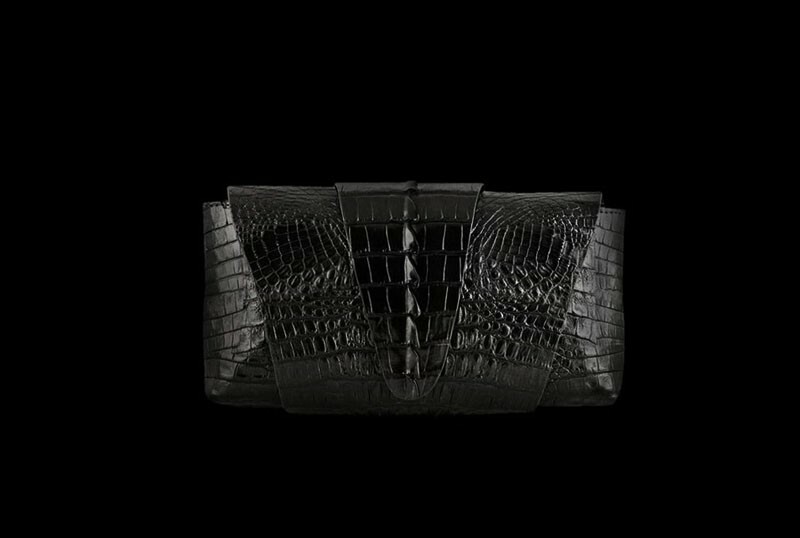 Exclusive bag clutch of glossy or matte black crocodile leather. Production of clutches for individual orders lacquer, glossy, matte suede and reptile skin. 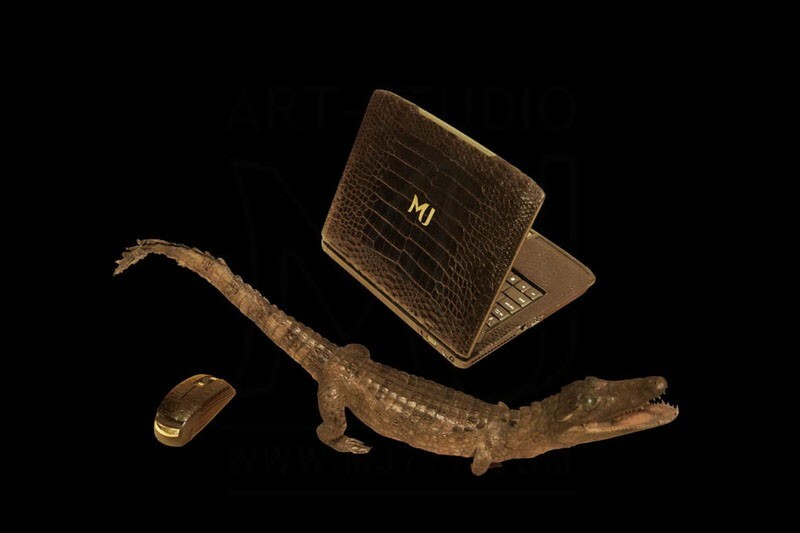 Unique laptop in the skin of a crocodile unique in the world of art-studio MJ. This notebook released in 3 unique editions, each individual model. 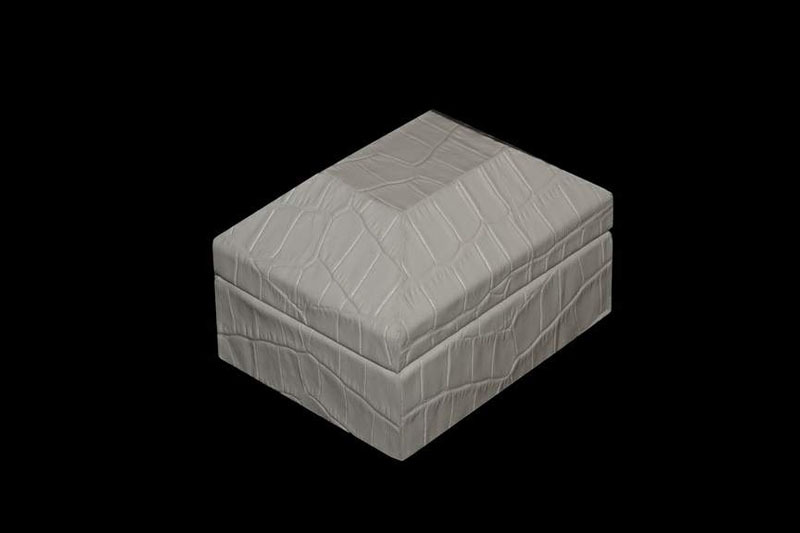 Luxury jewelry box decorated with genuine leather crocodile white. 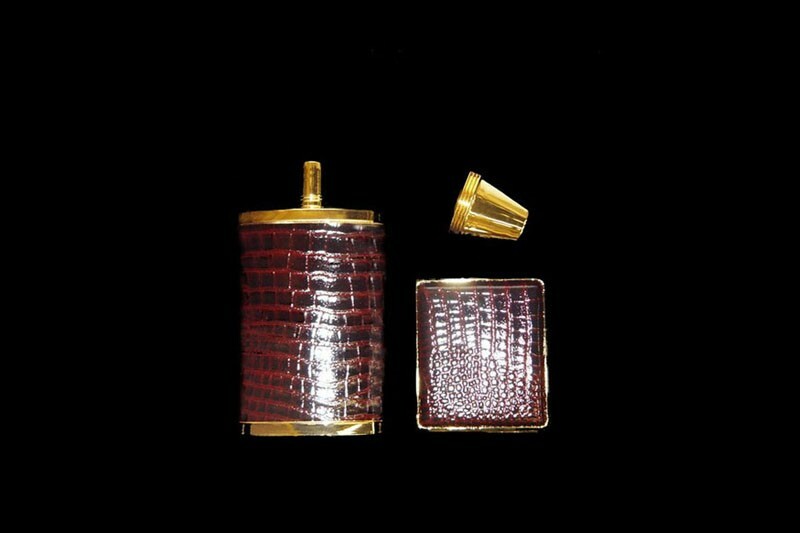 For any custom gift boxes and boxes of crocodile skin and any other exotic colors. 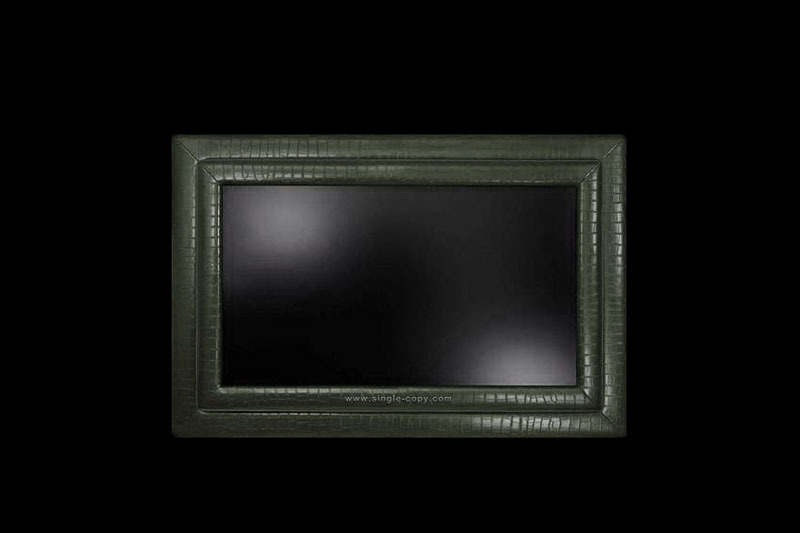 TV in a decorative frame made of genuine crocodile skin. Individual orders crocodile leather decor, all televisions, mirrors, picture frames, prints, etc. 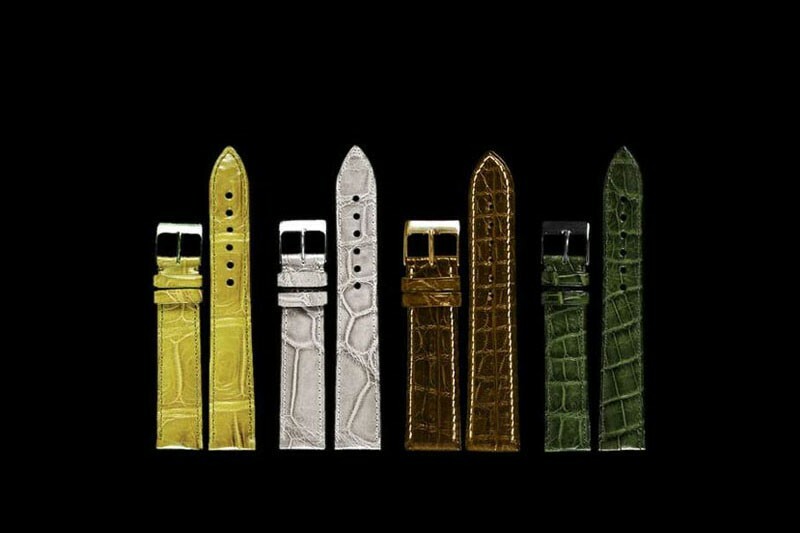 Luxury TV Exotic Leather Edition - Crocodile, Python, Ostrich, Iguana, Cobra, Wood, Precious Metals etc. Customize any model of Monitors, TVs, Frames, Plasma, Mirrors, Displays etc. 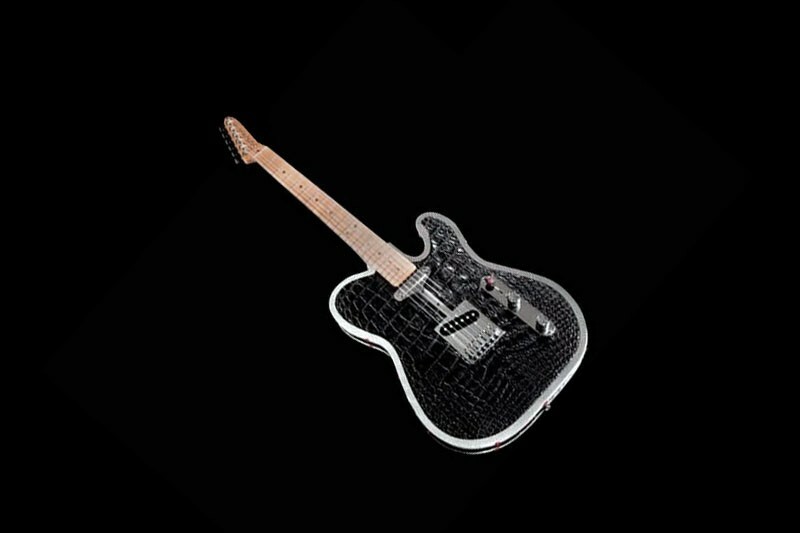 Exclusive guitar decorated with crocodile leather, precious metals and stones. According to custom tuning of any musical instruments crocodile leather and other exotic. 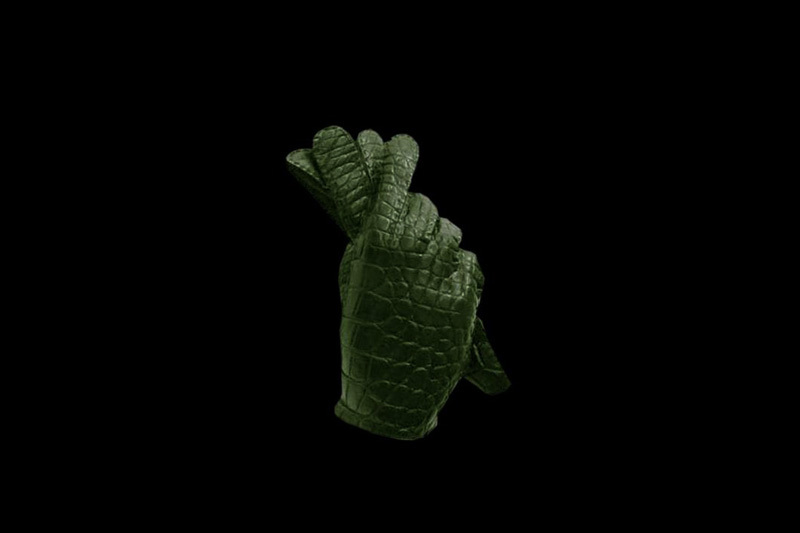 Luxury gloves made of genuine crocodile leather handmade. 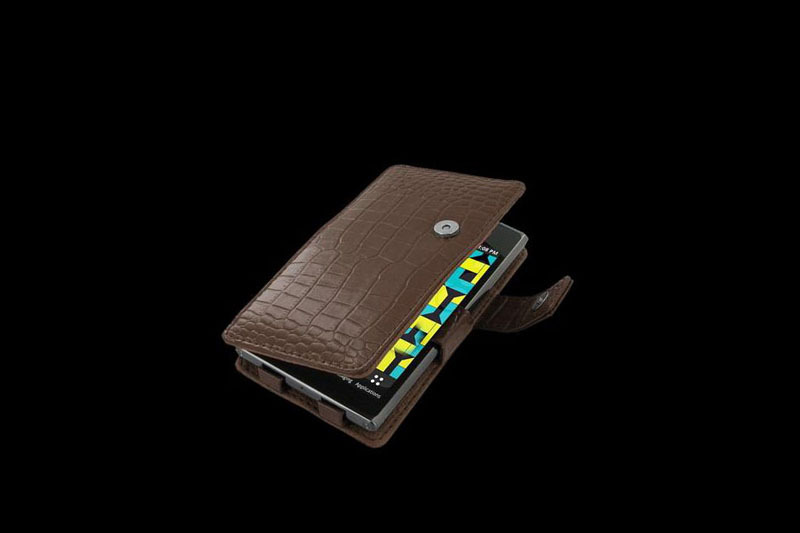 Luxury cases for tablets handmade crocodile skin, caimans, alligators and other exotic leather. According to custom any design and covers all kinds of colors and genuine leather premium. 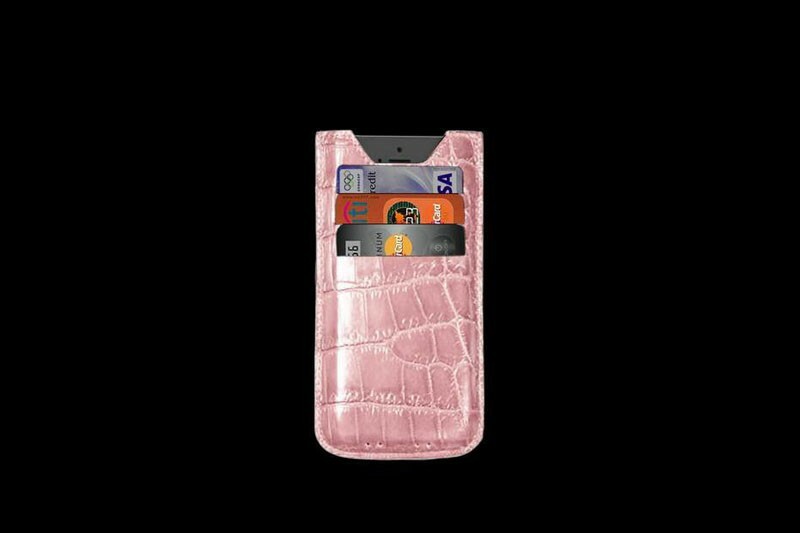 Exclusive purse from crocodile skin of any color. 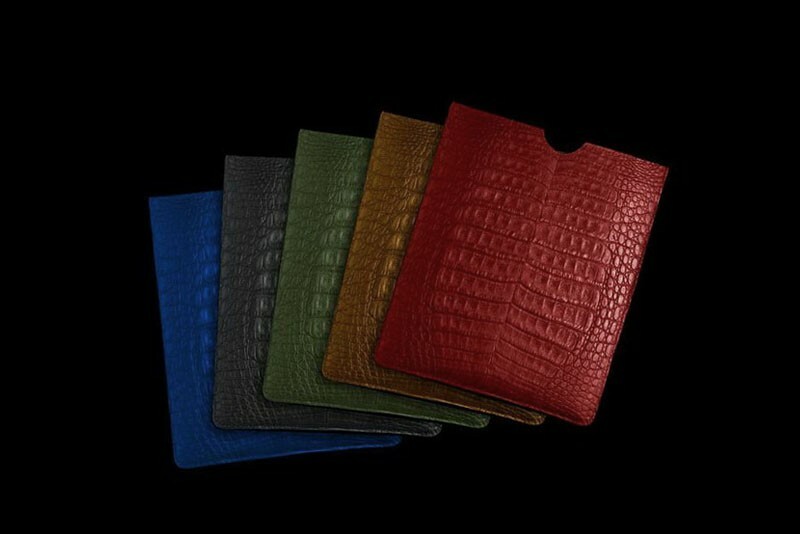 Any model of purses, men and women wallets leather crocodile. 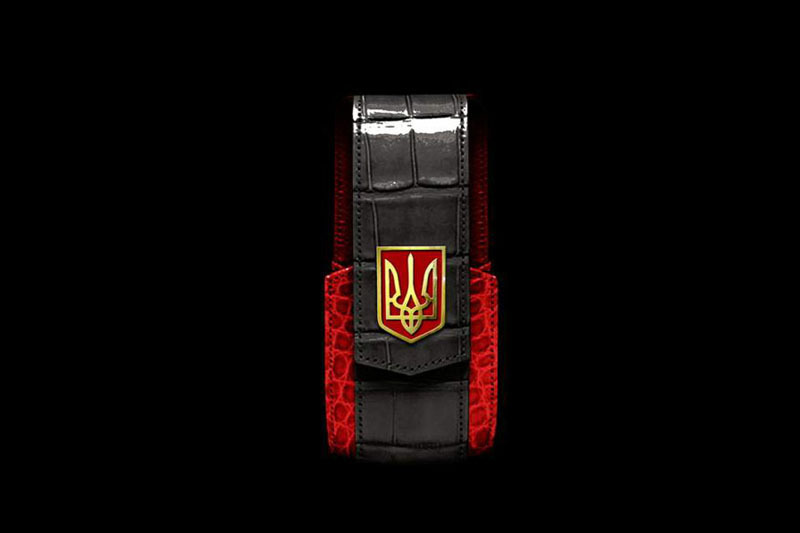 VIP Case for Vertu phone crocodile leather in different colors according to customer's choice with a gold emblem of Ukraine and other countries. 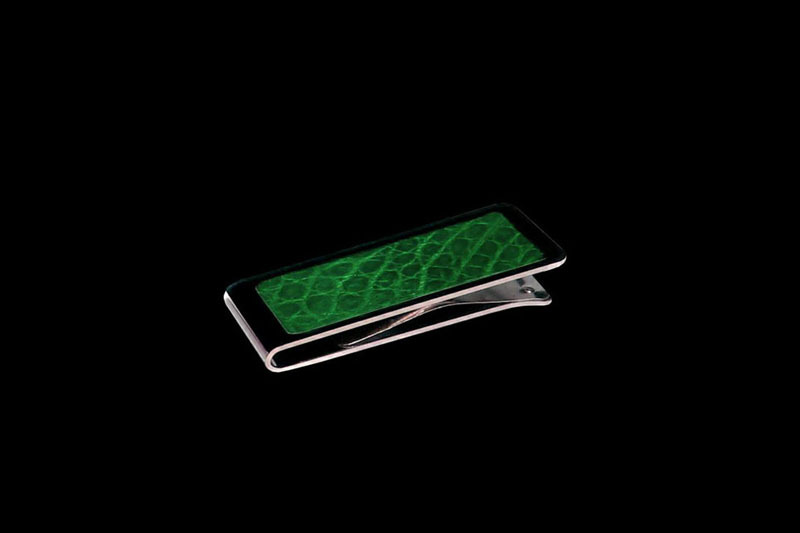 According to custom covers crocodile leather for all models of phones, tablets, smartphones and other gadgets. 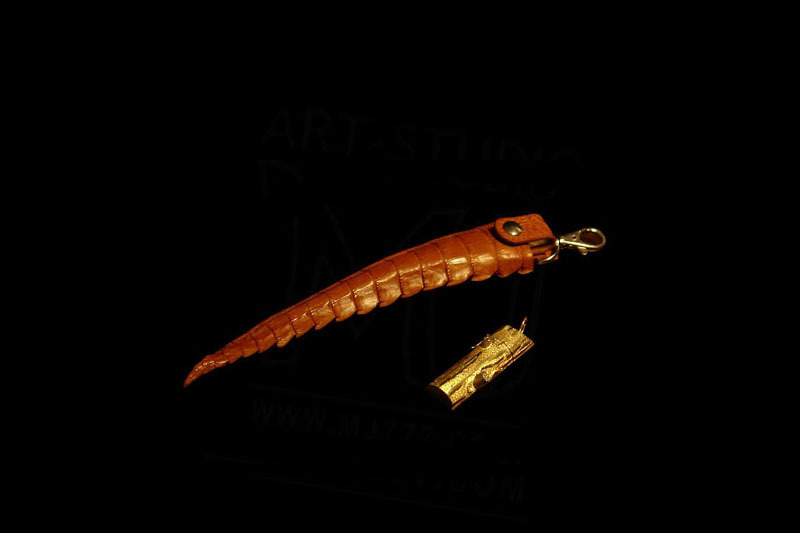 Leather flash memory sticks in the skin of a crocodile of all colors, textures and dressing. Fittings manufactured from steel, silver, gold, platinum, palladium and other precious metal species. Tuning phones crocodile leather. Replacement and repair of crocodile skin. 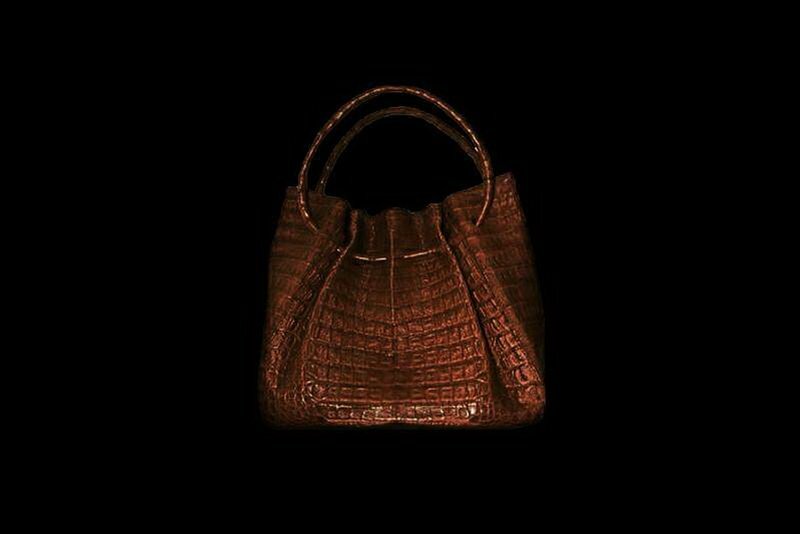 Elegant bag or sack of crocodile leather premium quality. Premium leather 1st category as. Handmade. Only large reptiles. Roomy bag in a bag shape, often with an open top and a belt to be worn on the shoulder. Luxury covers are available for all phone models in any design, the amount of natural. According to custom manufacture picture frames of all sizes, shapes, colors and exotic leathers. 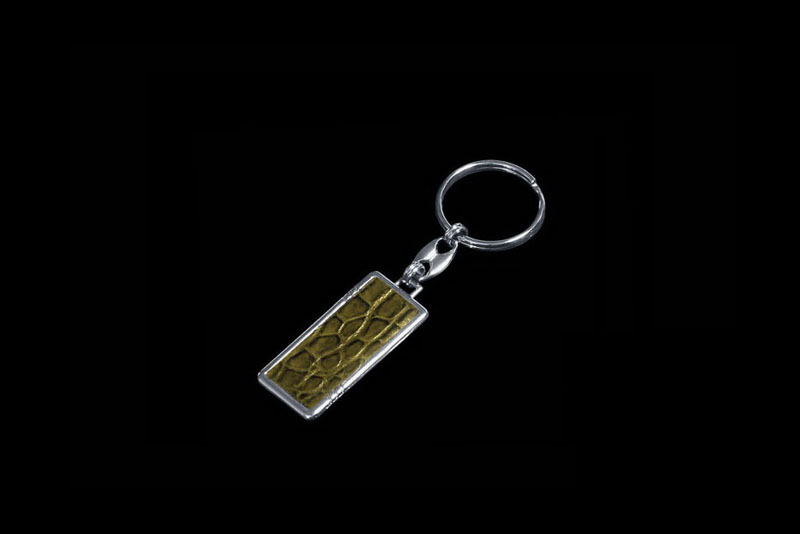 USB flash drive keychain genuine crocodile skin of the tail and a golden stick. 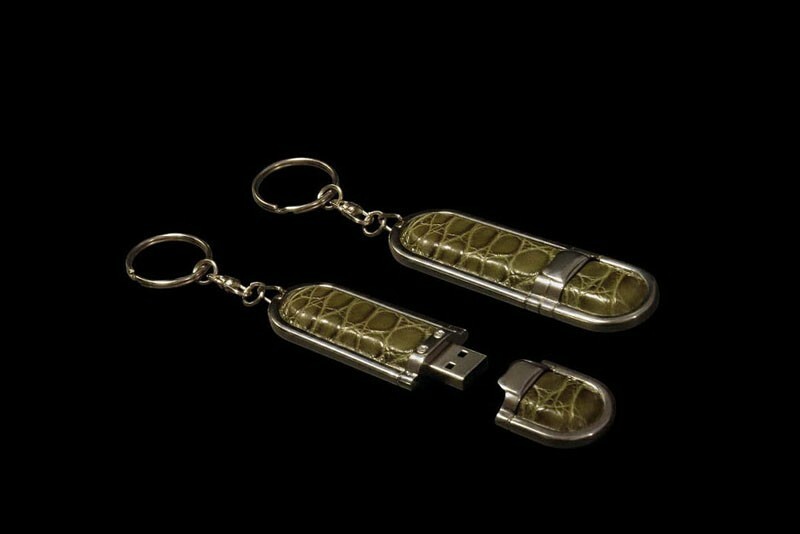 Flash drive encrusted in the tail of a crocodile. Diamond flash drive in the case of gold. 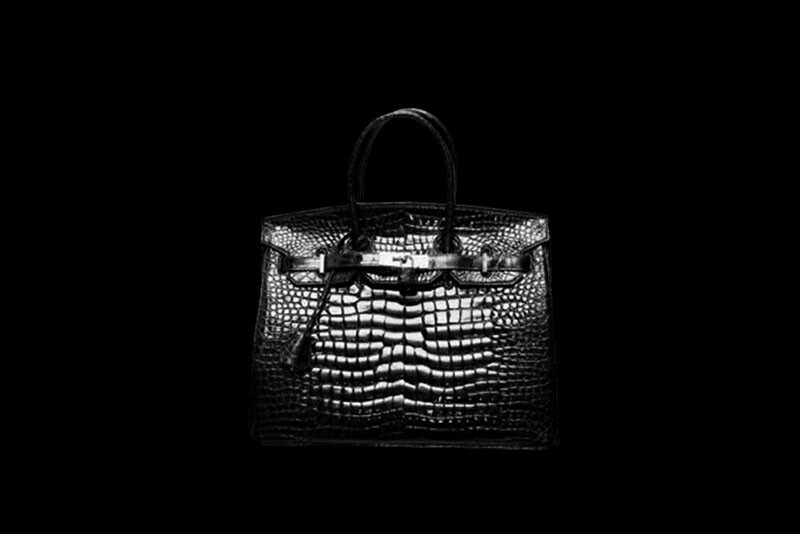 Luxury Handbags from crocodile head. Small bags for documents, wallet and phone. Large travel, hiking and sports bags. 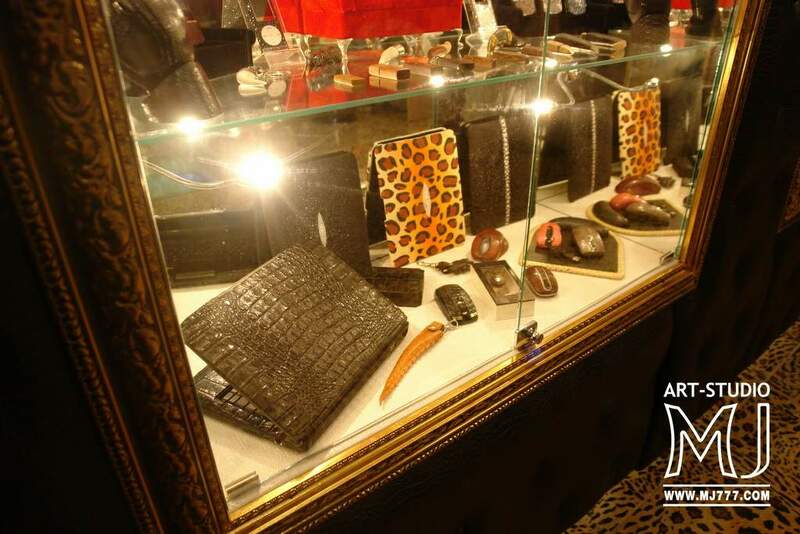 VIP wallets and purses of leather crocodile - crocodile, caiman, american alligator, gavial, porosus, jakare, oris etc. 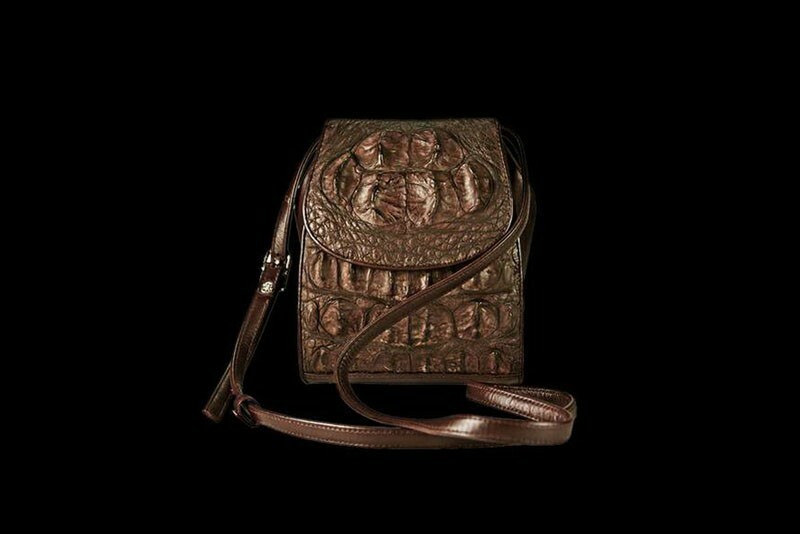 According to custom purses, passport covers and purses from crocodile skin of any color. 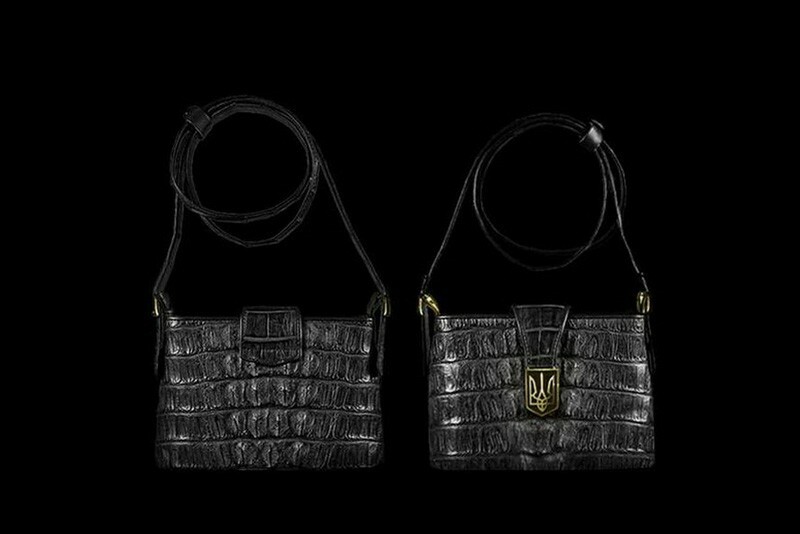 Luxurious bag made of crocodile with a gold emblem of Ukraine. Design of a mail bag over his shoulder. 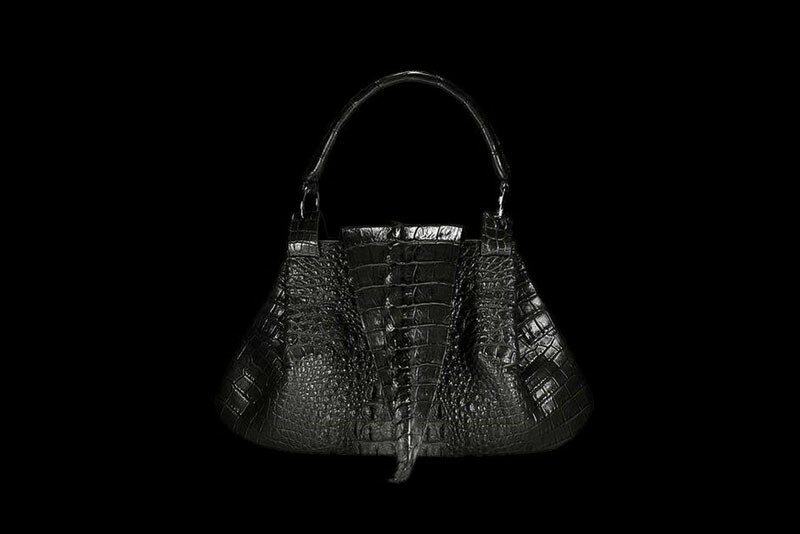 VIP bag crocodile leather with gold fittings 750ct, 777ct, 888ct and 999xarats. Individual orders customization bags, inlaid arms and national symbols of any State. 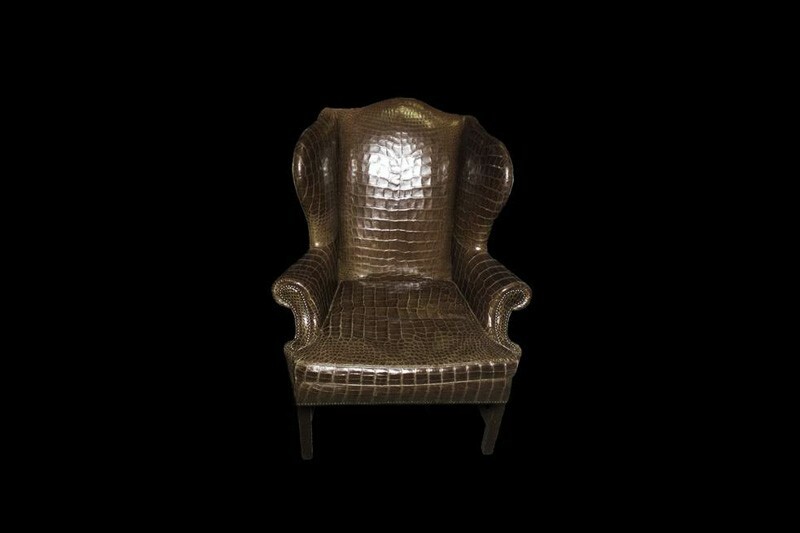 Exclusive armchairs, chairs, sofas, tables, cabinets, cupboards and any other furniture in the decoration of crocodile skin. Individual orders production of unique furniture and hauling crocodile leather and other exotics. 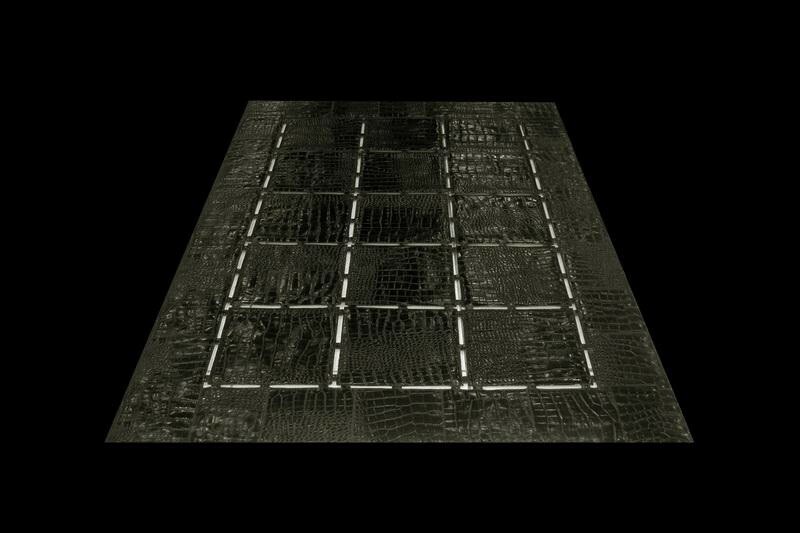 Exclusive interior carpet of genuine crocodile leather. 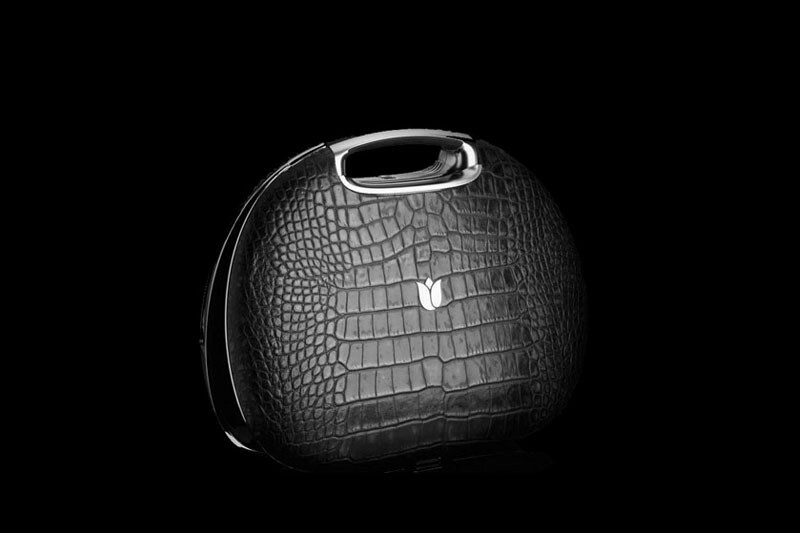 VIP door in natural leather with crocodile decorated with diamonds or stasis Swarovski. 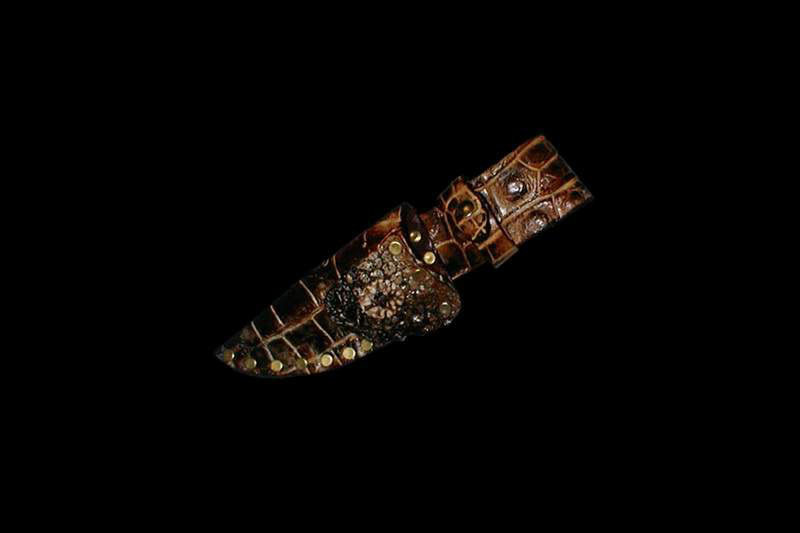 of precious materials - exotic leather, precious woods, stone, bone, Swarovski crystals. diamonds, silver, gilding, gold leaf, cast gold and other unique materials. 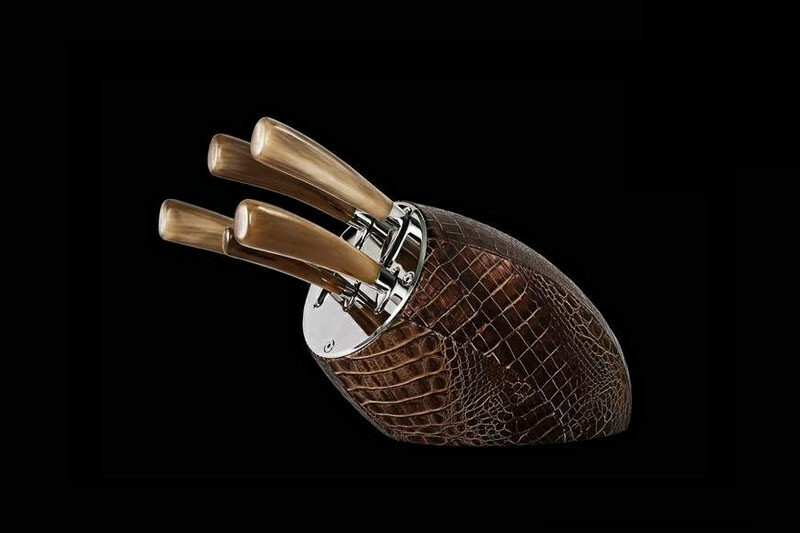 Luxury sheath made of genuine crocodile skin. VIP holster for any weapon for individual orders from exotic leathers. 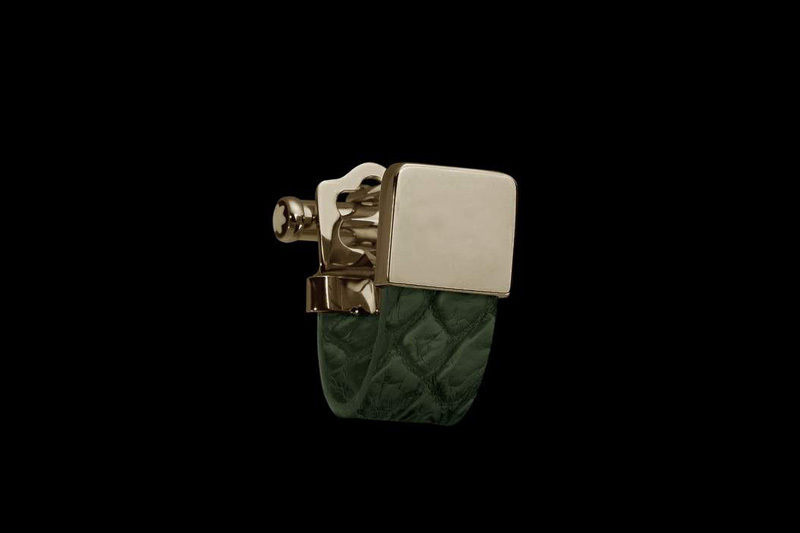 Flask, cigarette case in crocodile leather trim. Available in die-cast gold or silver gilt. 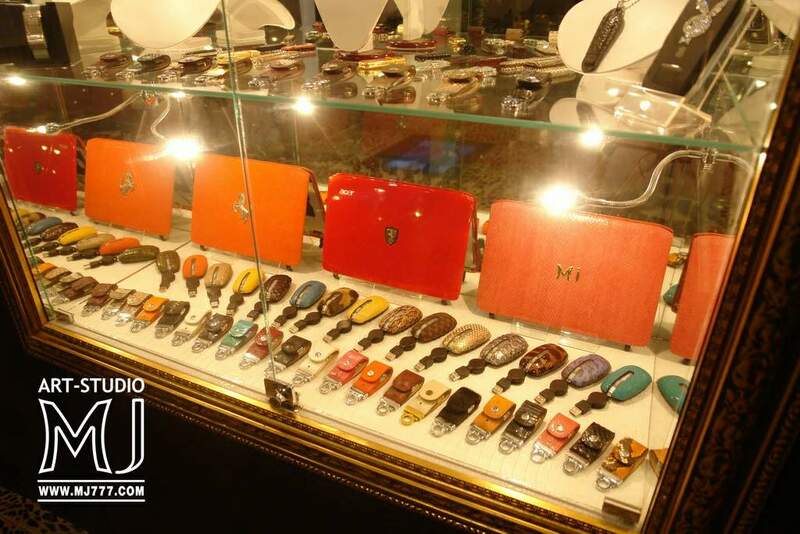 According to custom leather flasks, cigarette cases and other accessories in the skins of all colors. 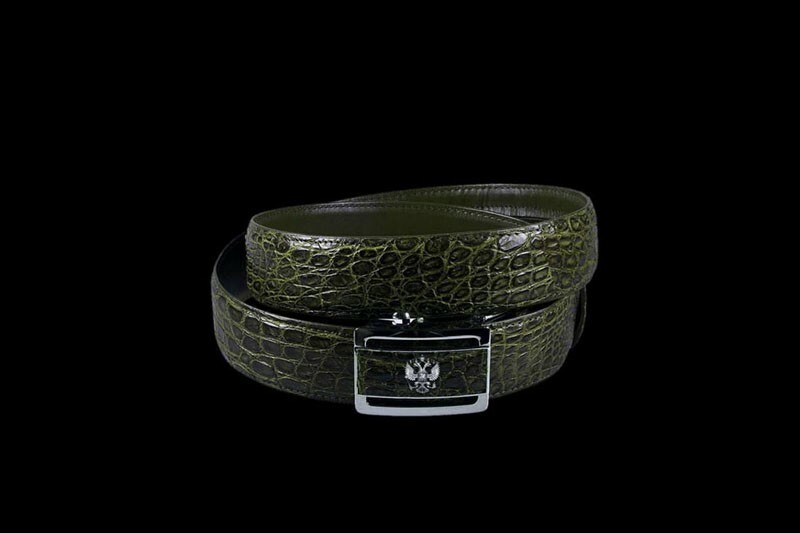 Belt made of genuine crocodile skin (abdominal part), with an insert in the buckle of the emblem of the Russian Federation in white gold. Individual orders belts inlaid with any symbolism of precious stones and metals. 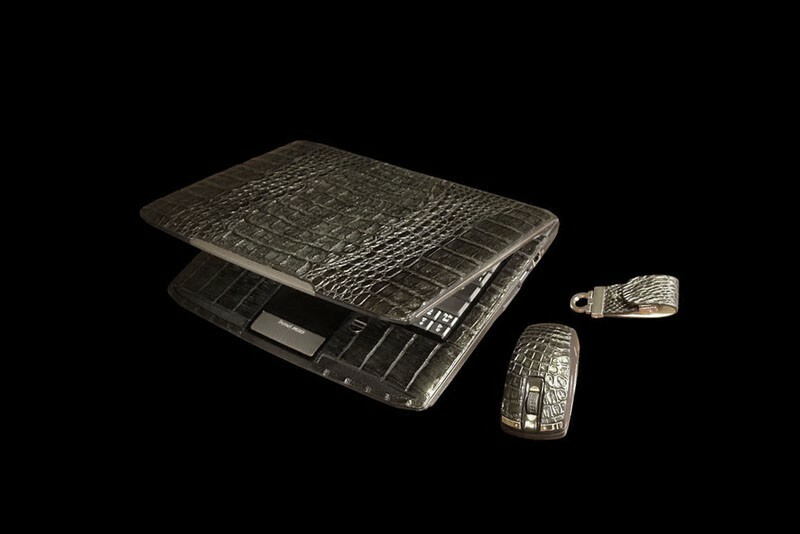 Exotic crocodile belly genuine skin with white gold emblems of Russian Federation. 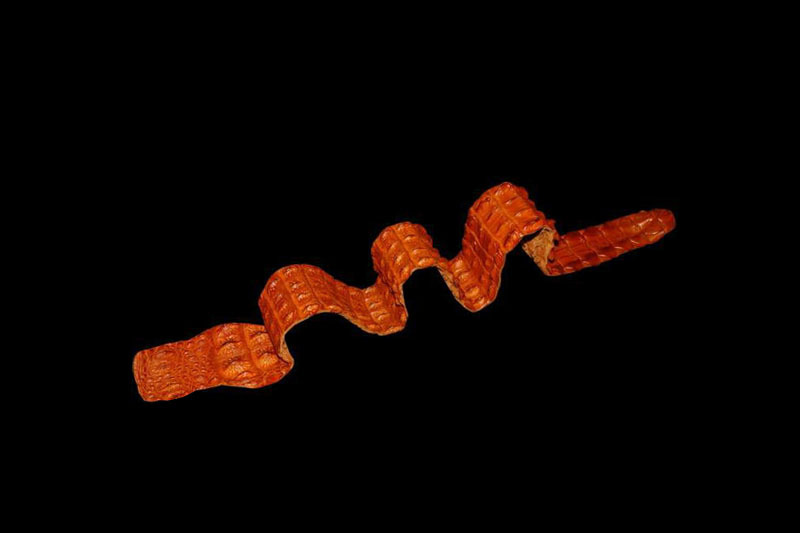 Unique belt made of solid ridge crocodile. These spikes. This exclusive. Extremely wild design. belt out of the stone of the crocodile. 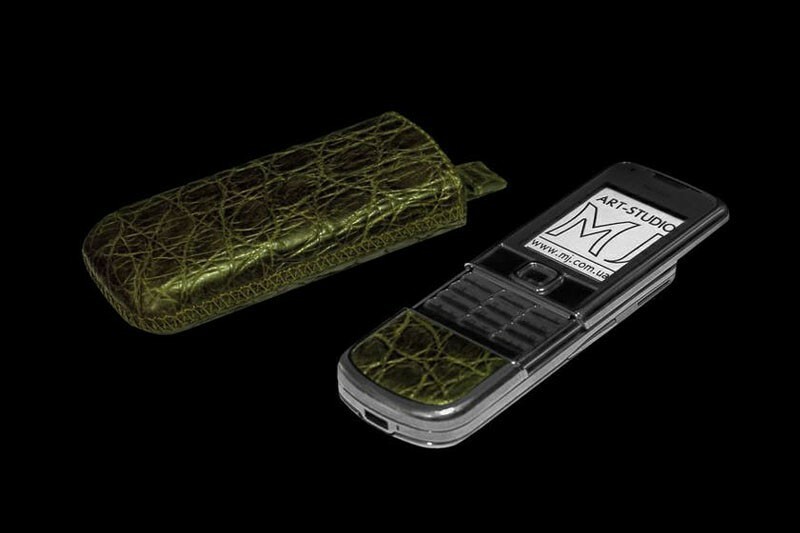 Tuning Versace branded phones in the skin of a crocodile, and any other exotic of all colors. 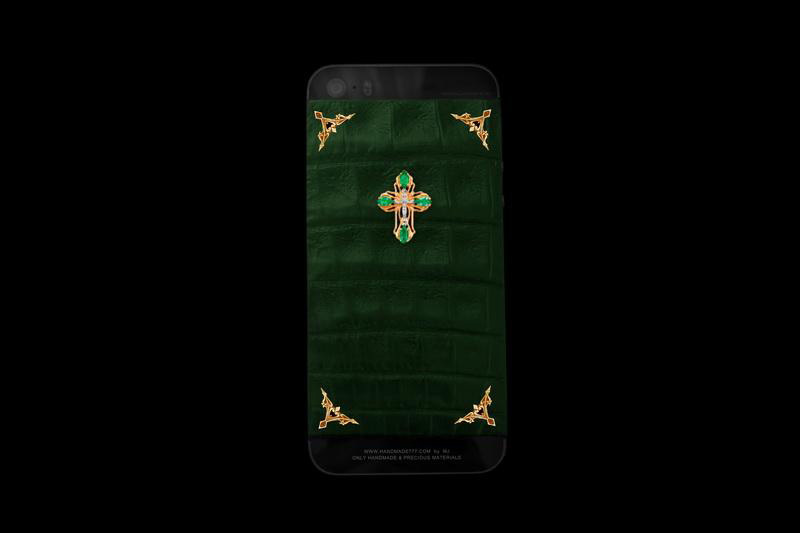 IPhone in the skin of a crocodile with a cross and decorative elements made of gold with emeralds. According to custom any color crocodile. Inlay any religious and personal symbolism. 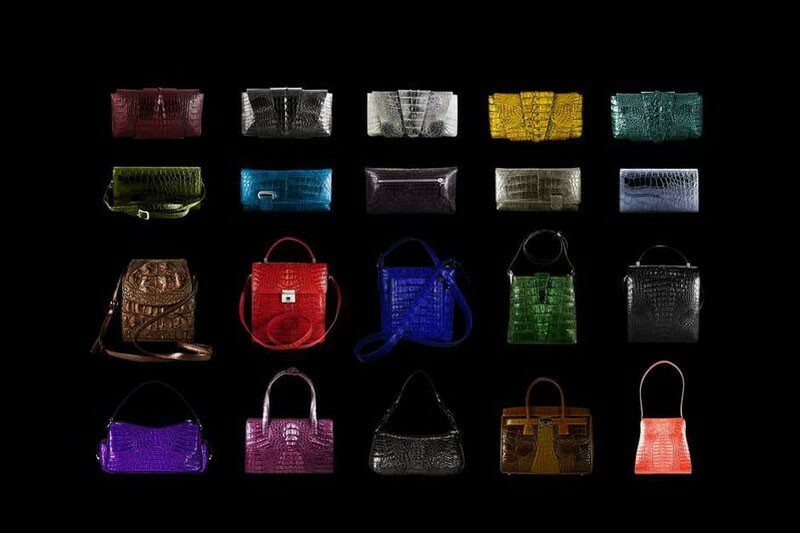 Any Color & Type of Exotic Leather - Crocodile, Alligator, Caiman, Ostrich, Stingray, Python, Cobra, Fish, Lizard etc. 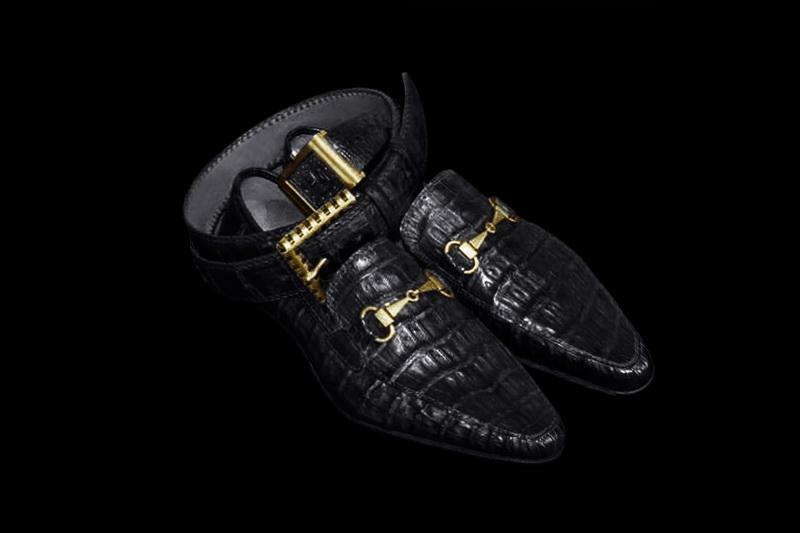 Luxury shoes crocodile leather with a buckle of gold, sapphires, rubies and diamonds. 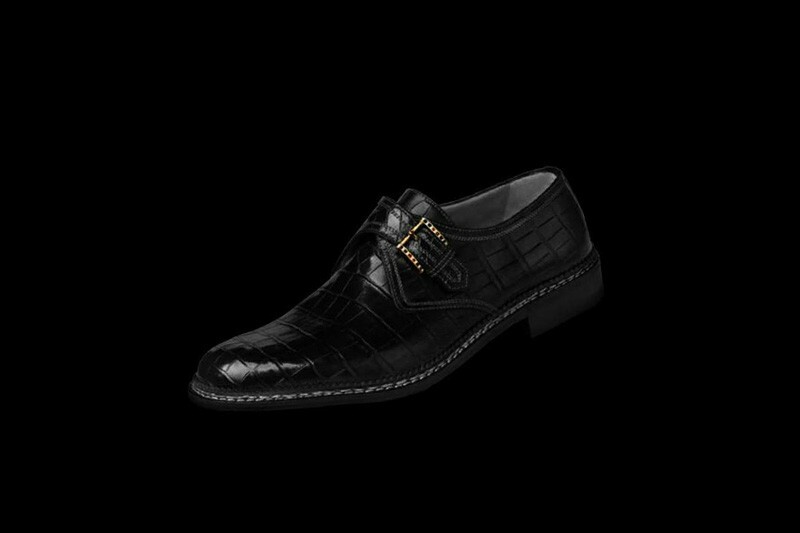 Elite Shoes Made of Crocodile Leather with Gold & Gems Inlaid - Sapphires, Rubies, Diamonds. 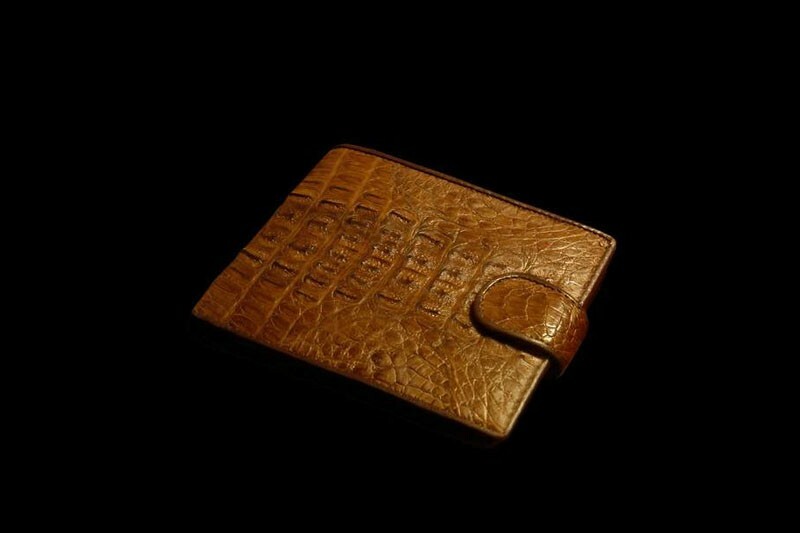 Case-book of crocodile skin for LG Prada phones and any other models and brands. 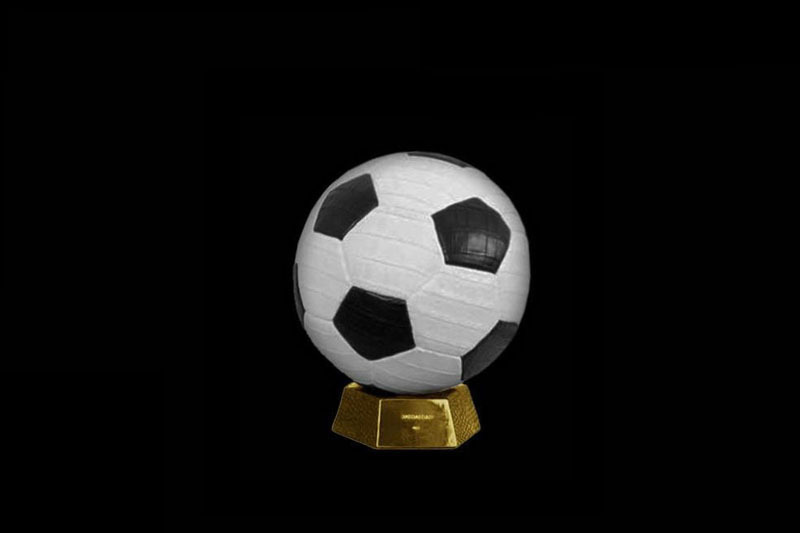 This soccer ball from crocodile skin. Deluxe edition balls and other handicrafts. Individual orders any balls, boxing gloves, pears, sports wear and other sports leather accessories. Luxury guitar case made of genuine crocodile skin. 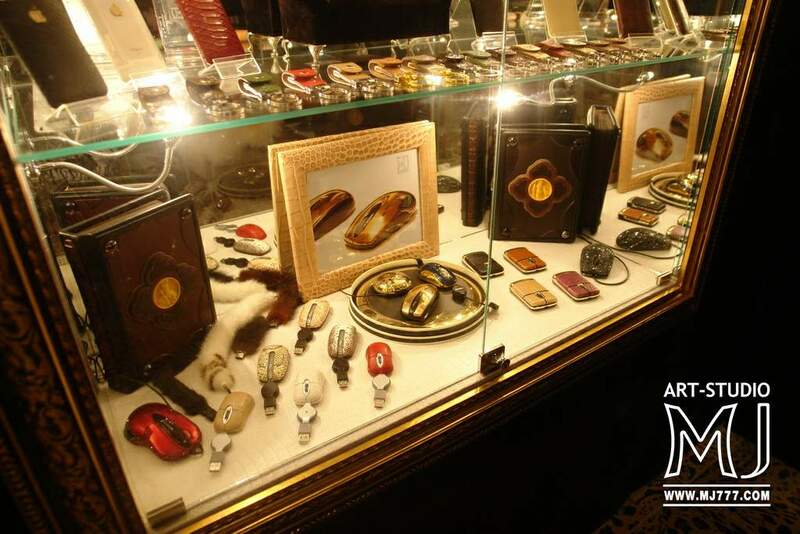 Cases for individual orders from crocodile skin and other exotic to any musical instruments. Possible application of individual stamping or inlays any slogan, brand, label, coat of gold or silver. 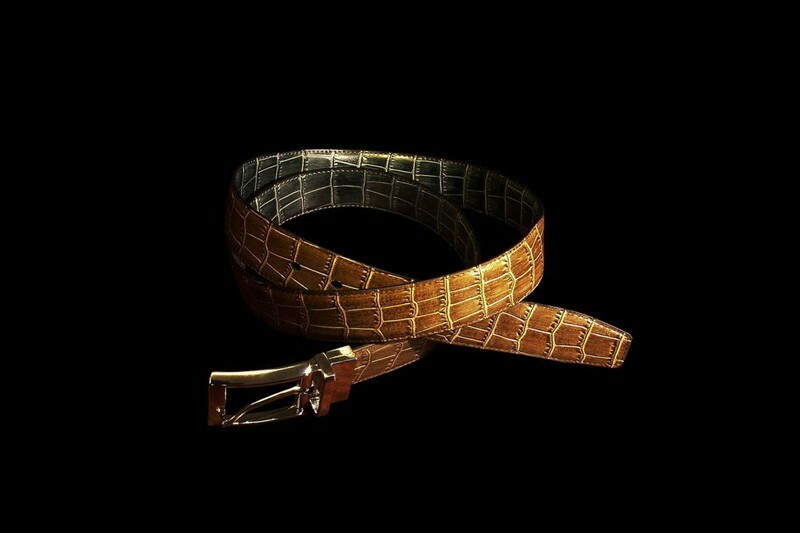 Exclusive two-sided crocodile leather strap brown and black. Changeling buckle of gold 750-th sample. According to custom any color and skin types. Individual orders belts handmade from all kinds of colors and exotic skins. Author's handbag handmade crocodile leather inlaid with gold. According to custom inlay any logos, signs of the zodiac and other symbols. of all products. Footwear and accessories of all sizes and colors of the different kinds of exotic leather. Any model. Any size. Any kits. Any type of exotic leather. Any color. 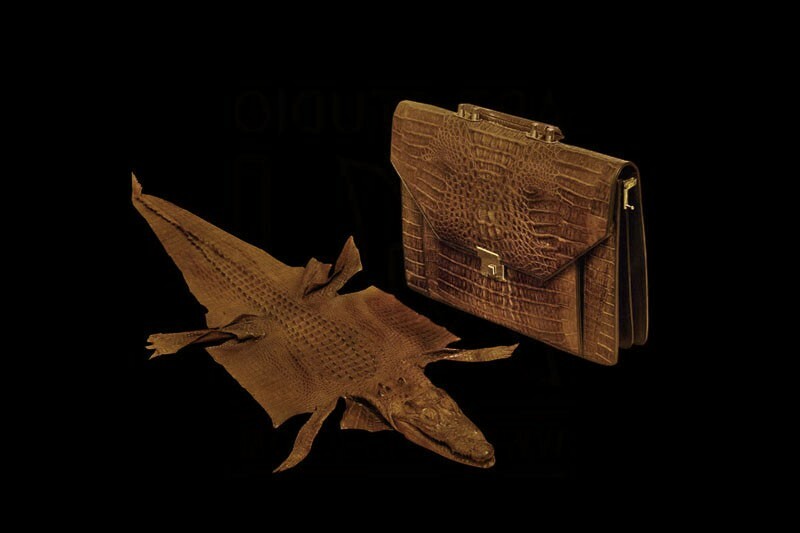 Crocodile skin of manual manufacture for the production of portfolios and any other leather products. 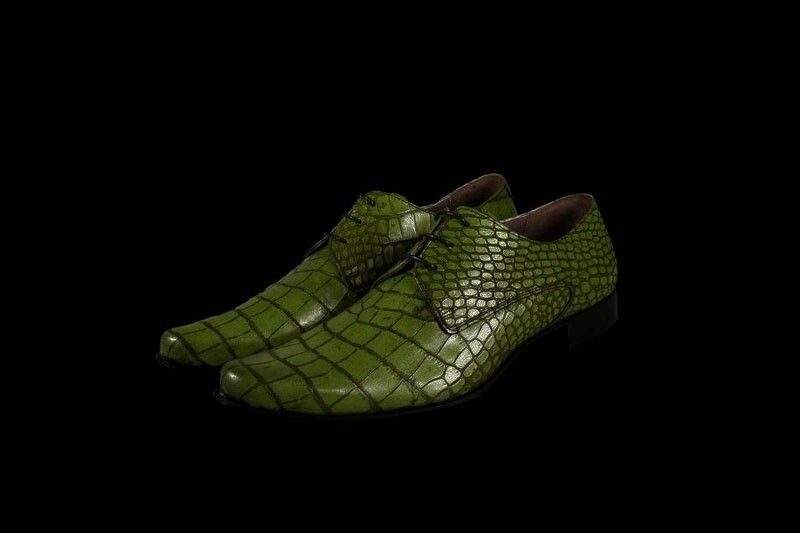 By custom tailoring any leather crocodile, caiman, alligator and other exotics. 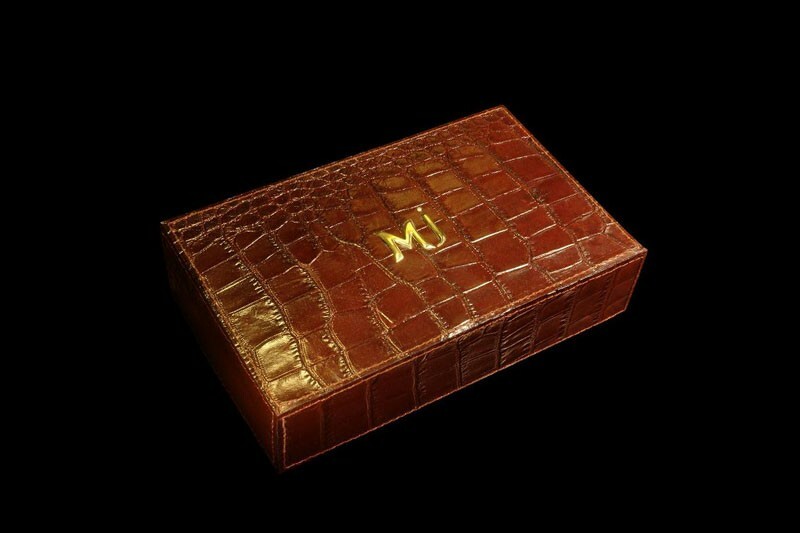 MJ LUXURY SET CROCODILE LEATHER L.E. Tuning phones and sewing VIP covers the skin of a crocodile tail. Individual orders any part of the skin of a crocodile. Crocodile leather with studs and without. Smooth and textured. Luxury calculator crocodile leather with gold buttons and rivets with diamonds. Unique business gift VIP class. Only handmade and luxury materials. 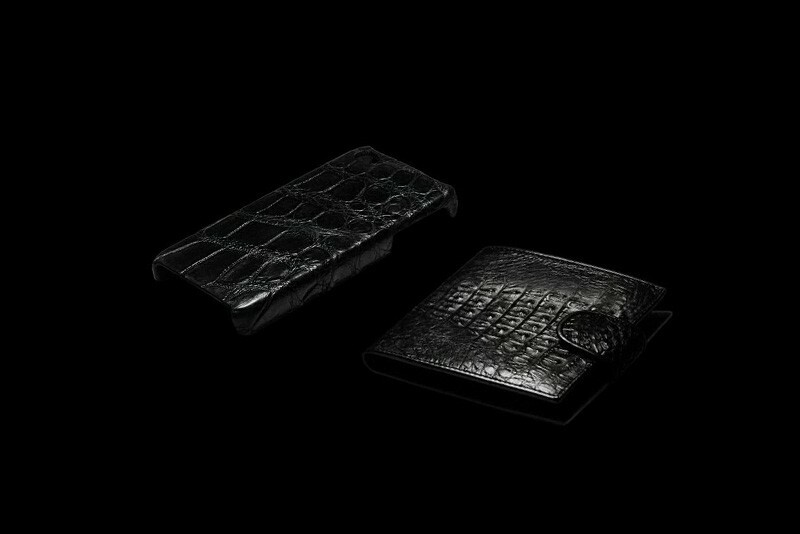 Exclusive box crocodile leather and buffalo leather with embossed. 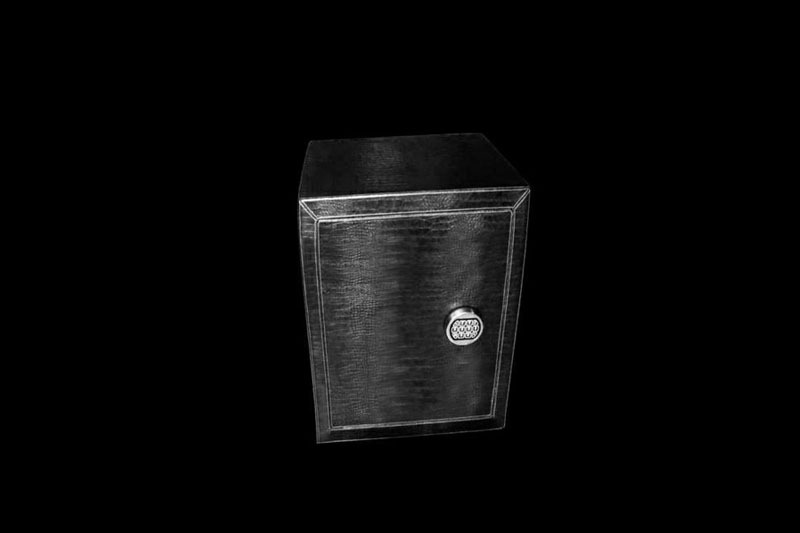 Exclusive box for jewelry, belts, hats, clothing and other luxury accessories. According to custom leather boxes and boxes of all shapes, sizes and colors with personalization. According to custom manufacture any trinkets shapes, sizes, designs and materials. 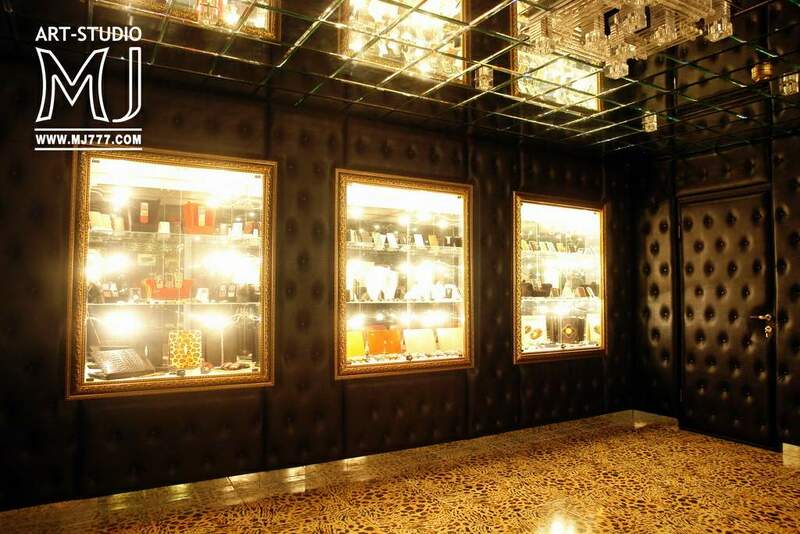 In manufacture the only precious metals and exotic leather, fur, wood, carbon fiber, ammolite etc. Ridge Nile crocodile leather caramel color. Individual orders crocodile Backstrap all sizes and colors. Favorite leather for fans of extreme products spiked crocodile. 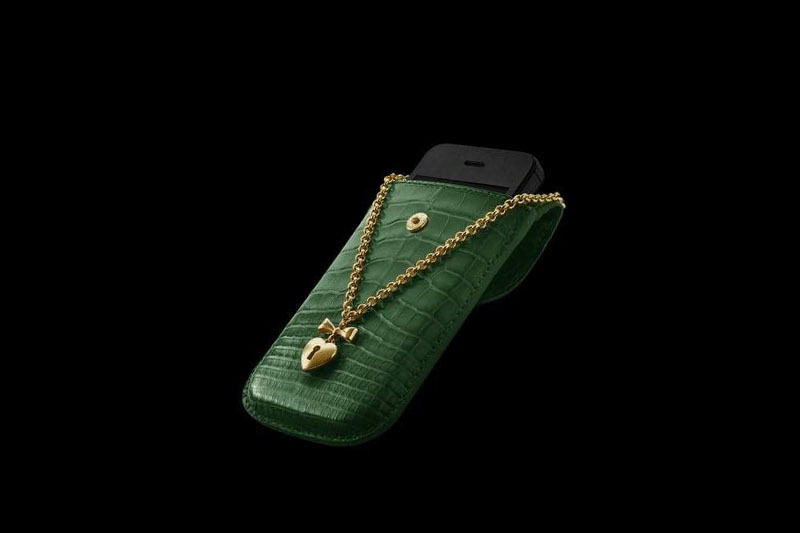 Glamour Case Crocodile leather with a gold chain. 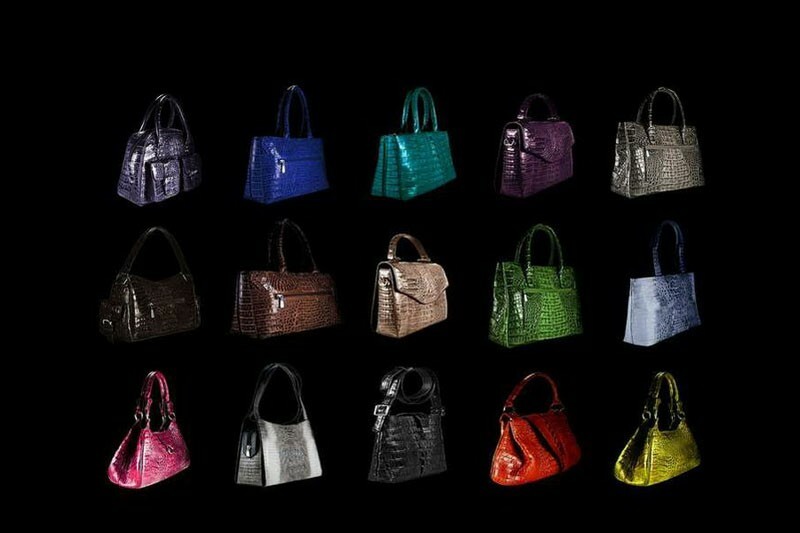 According to custom any size cases and bags in all colors alligator. Chain can be in the form of a suspension heart, padlock, initials, emblems, signs of the zodiac and any other symbols. The buttons can be made of wood, leather, silver, gold and other luxury materials. 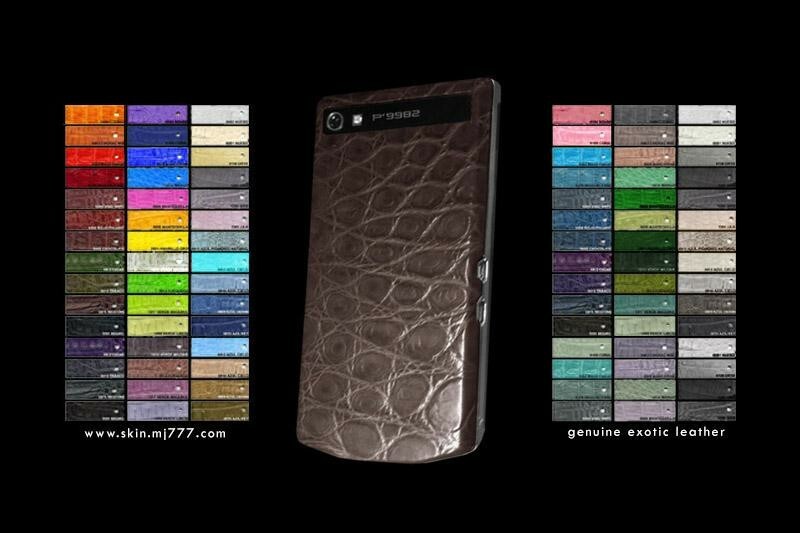 Exclusive covers and custom phones in the skin of a crocodile all textures and colors. 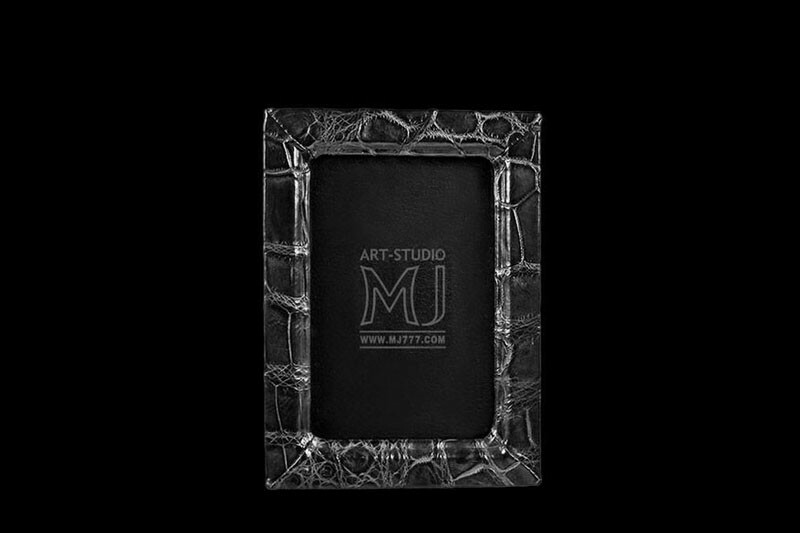 For production use only genuine leather crocodile premium quality of art-studio MJ. 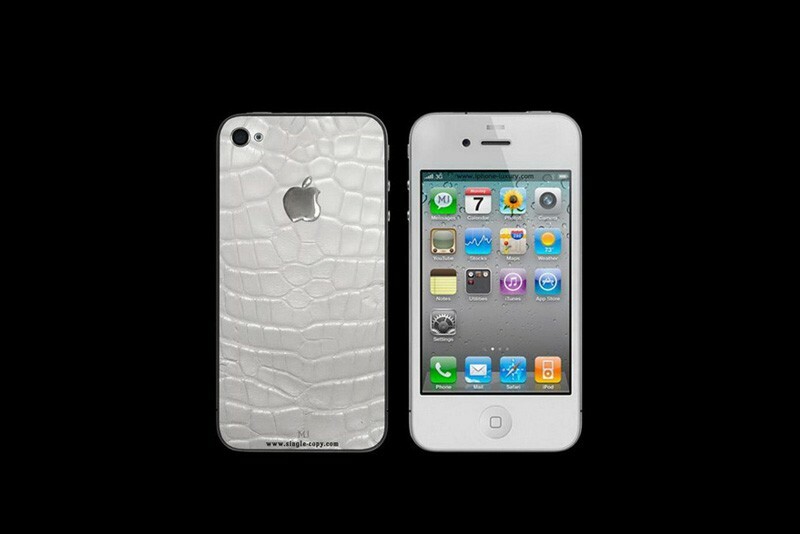 Unique Apple iPhone in white 18-carat gold and white genuine leather crocodile. Individual orders encrusted emblems, logos, and other symbols of the drag. metals. 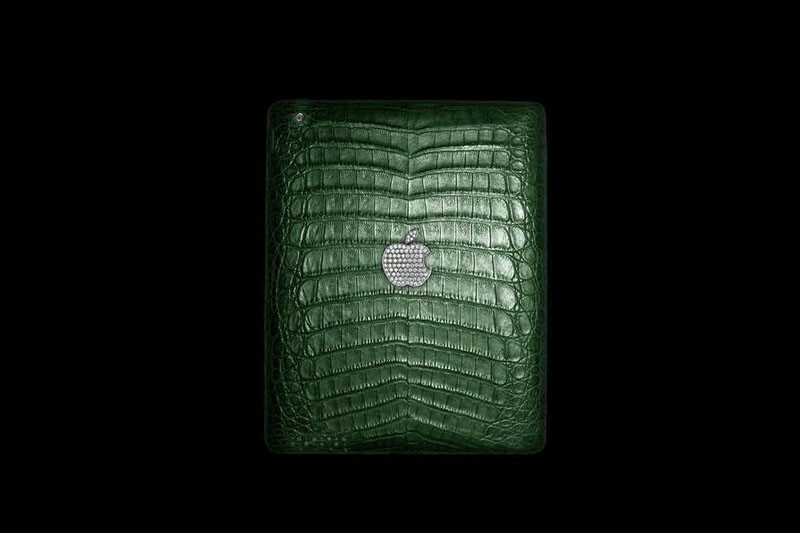 Luxury iPad in green leather and crocodile emblem of platinum and diamonds. Any color. Handmade. Based only on branded models of Apple iPad and Apple iPad Mini. 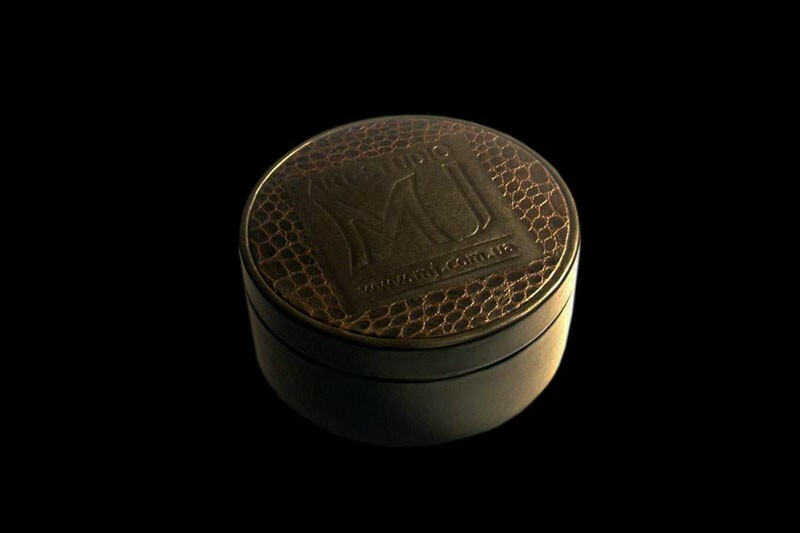 Exclusive mini flash drive and etui for the stick. Flash card and mini case white leather crocodile. According to custom flash drives in crocodile leather trim any color. As well as cases for flash cards of all shapes and sizes from all types of skin. Elite ultrabook Lamborghini. Housing in the skin of a crocodile. Logo and gold. According to custom tuning any models of laptops in all kinds of exotic leather. 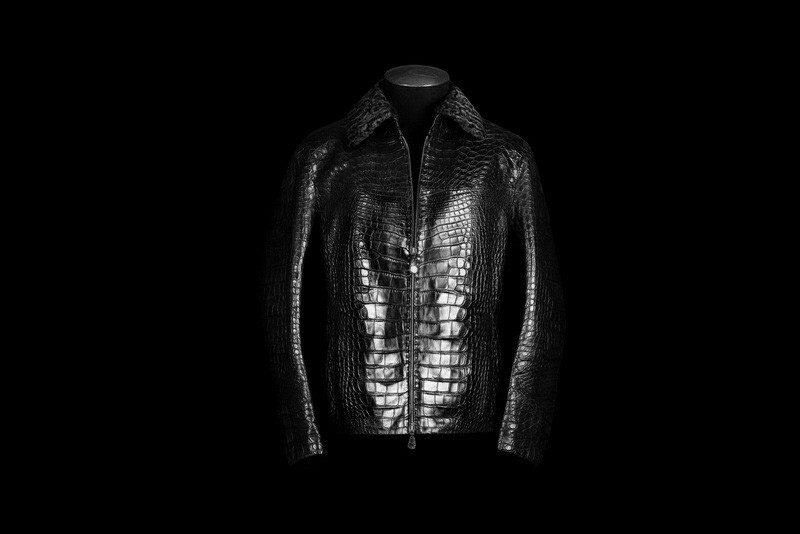 Exclusive jacket crocodile leather handmade. Any model of male and female crocodile jackets. Any model. Any color. Any size. Only handmade. Only natural materials. Shoes for individual orders of any kinds of exotic leather handmade. Custom-production of the author's shoes all colors and sizes. 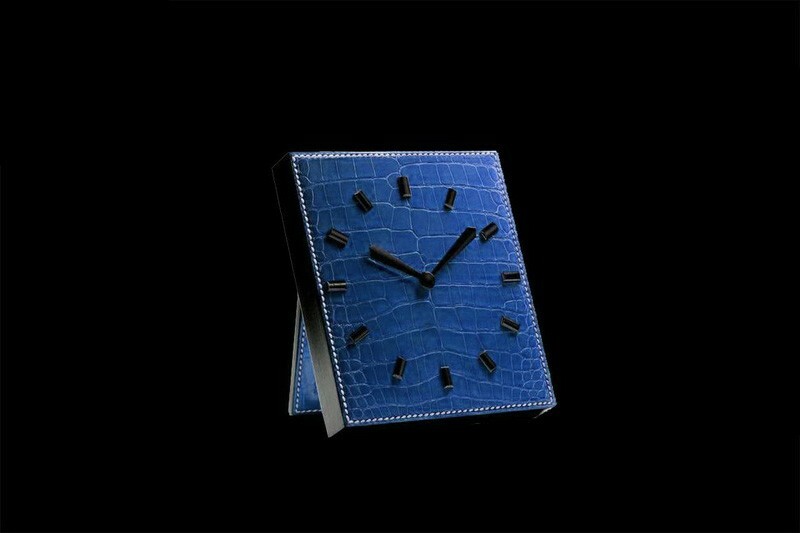 Exclusive interior clock in crocodile skin. According to custom designer watches in natural leather crocodile and other exotic of all colors. Table clock in the skin of a crocodile. Wall clock in crocodile skin. Any other home furnishings in the skin of a crocodile. Any model. 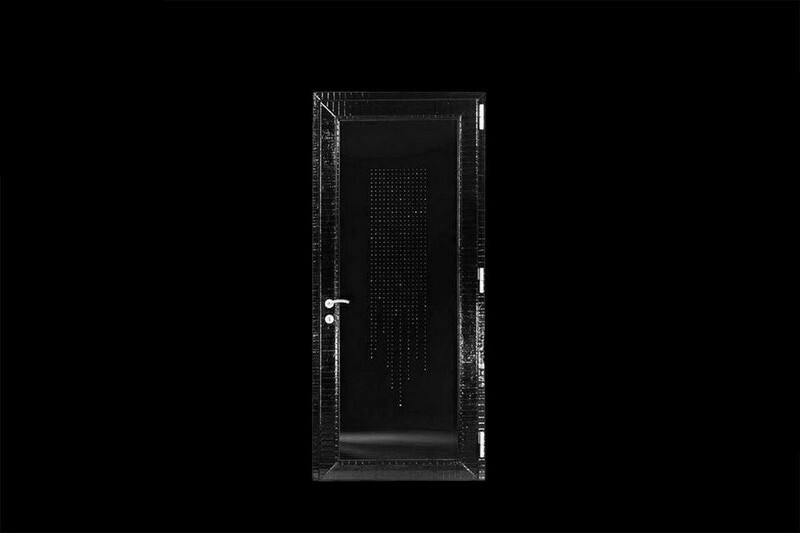 Any design. Any size. Any kind of skin. Any color. Only individual orders and handmade jewelry quality. Accessories trinkets of silver, damask, damask steel, gold, platinum, palladium, rhodium, and other metals. 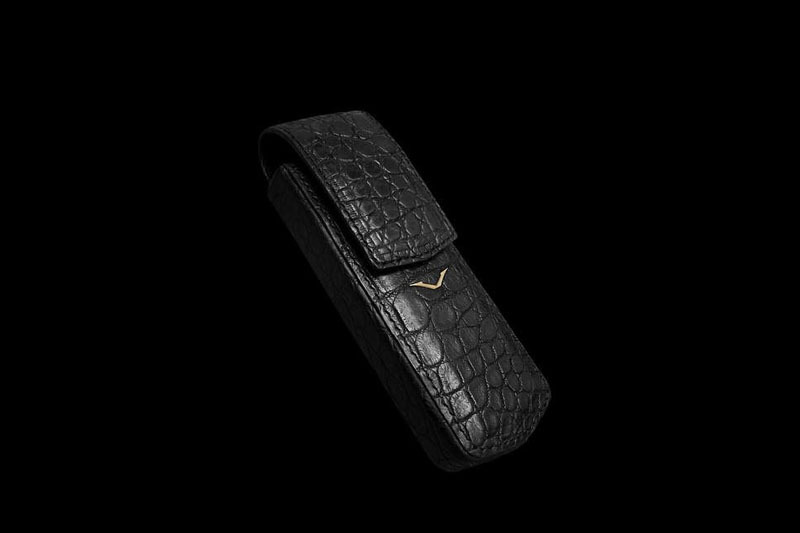 Gift box crocodile leather of the highest quality with the emblem of gold with diamonds ID. According to custom boxes of all shapes and sizes of crocodile skin and other exotic of all sizes. 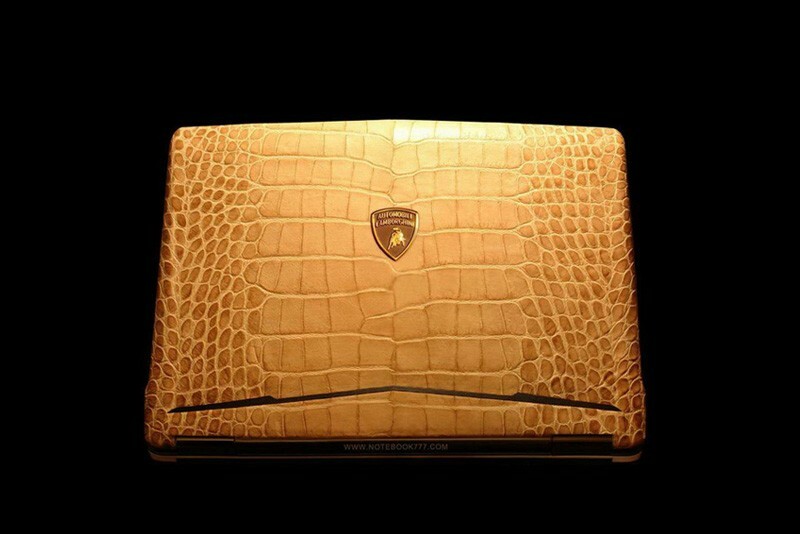 Luxurious golden laptop and mouse skin of a crocodile and python. 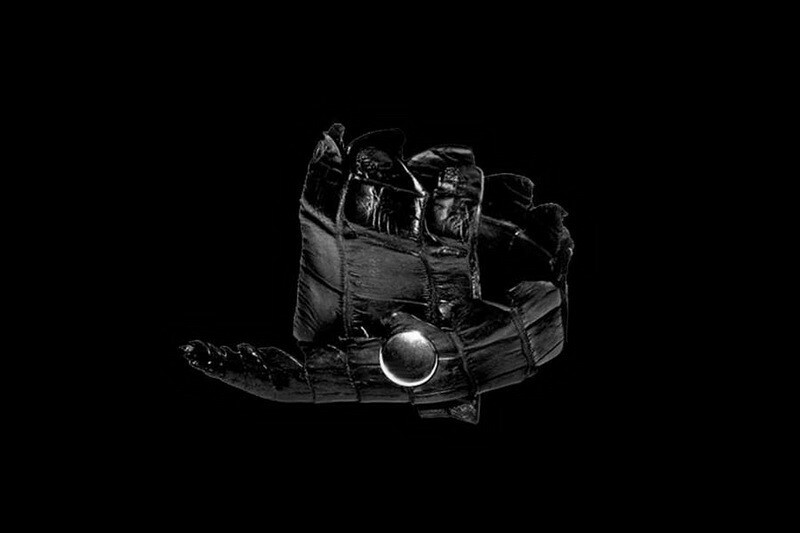 Royal equipment.